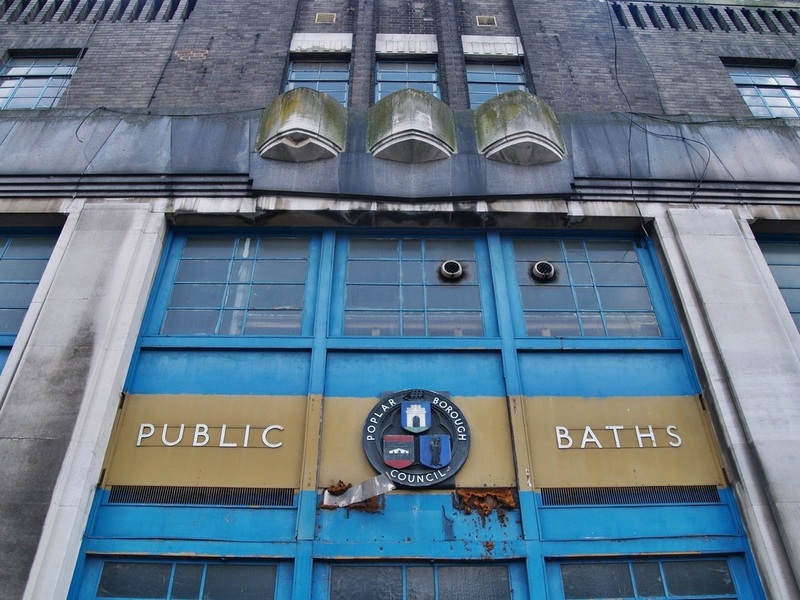 This page is a collection of photographs of derelict swimming pools and baths in London. 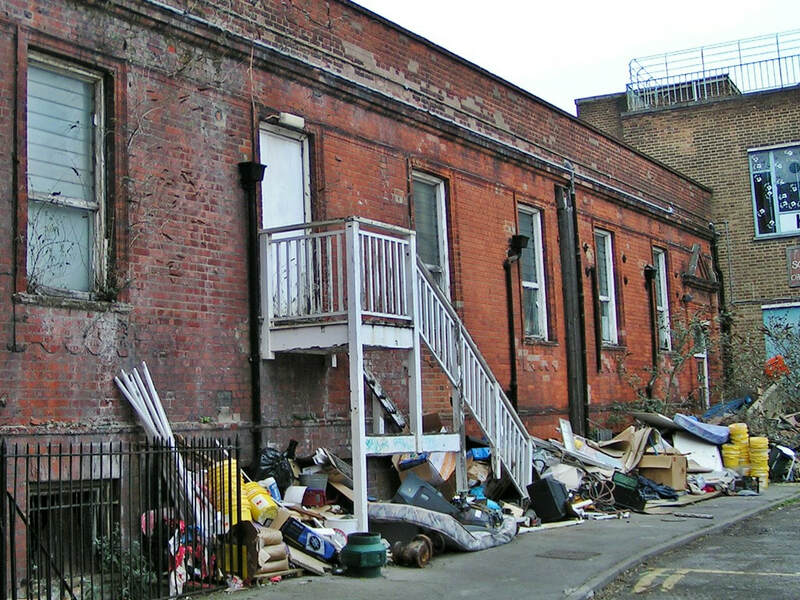 Some remain derelict and some have been refurbished, demolished or converted into flats in the ever changing face of London. All photographs are by Paul Talling except where stated. 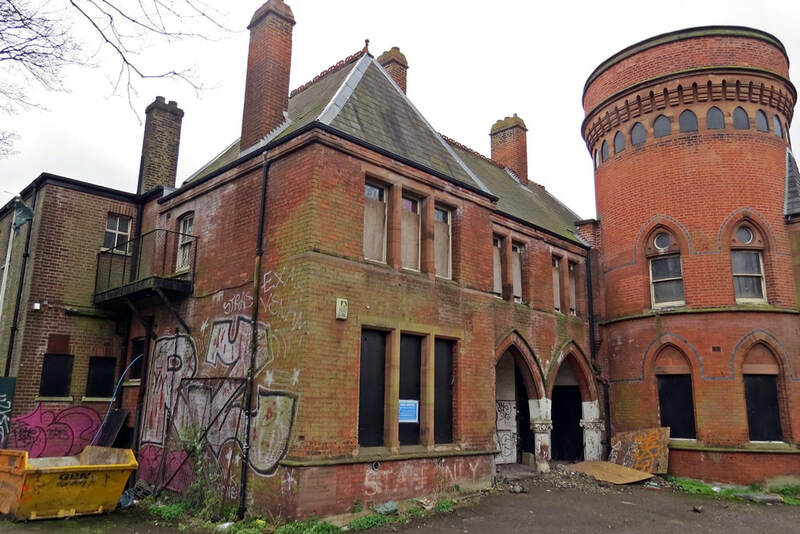 ​This unusual red-brick gothic building just outside Lewisham was built in 1884 and called Ladywell Baths.They are one of the earliest surviving public baths in the capital.The Ladywell Baths were built on a site procured by the vicar of the adjacent St Mary's Church. 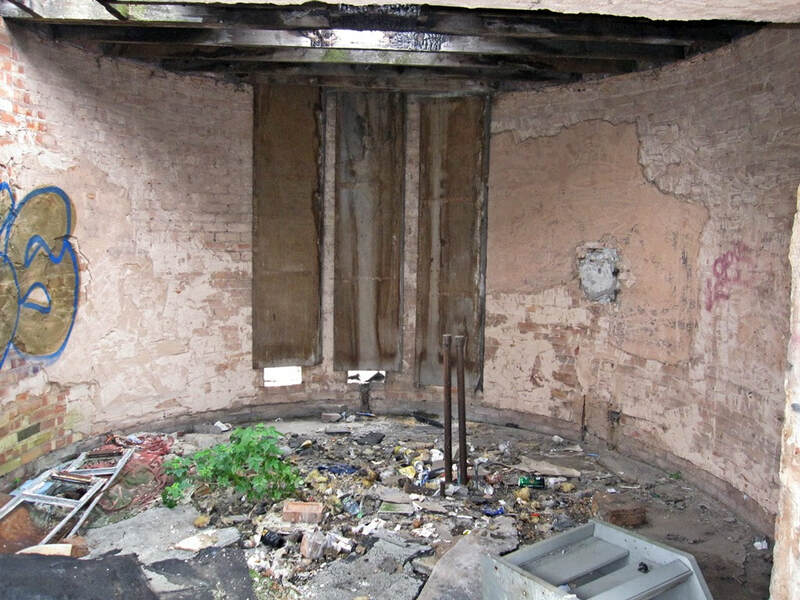 At the time, a local paper commented on the juxtaposition of church and baths that 'cleanliness was next to Godliness'. 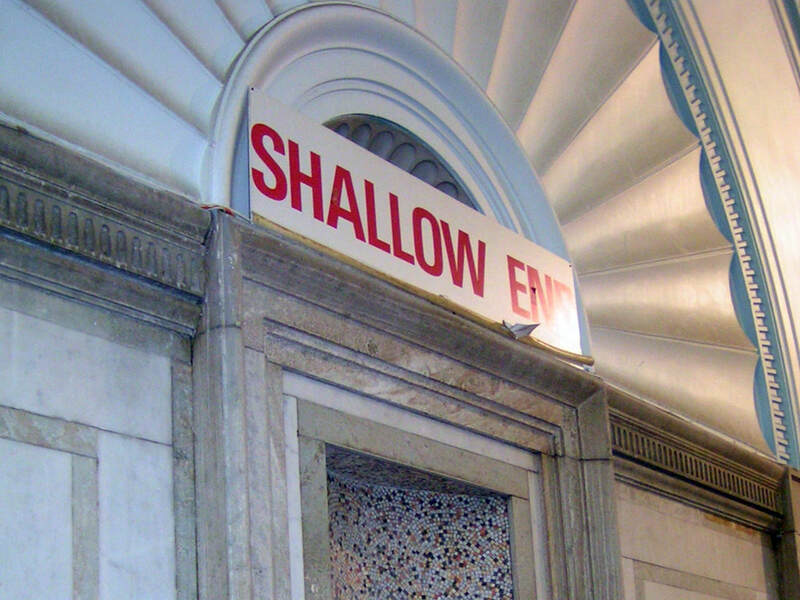 It had two public swimming-pools – one for first-class and one for second-class users. The charges for use were originally 6d for the first class pool and 2d for the second class. 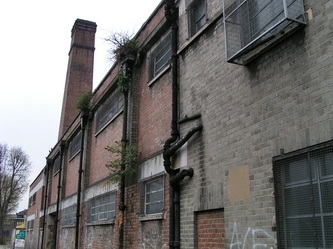 The building had live in accommodation for the buildings wardens who would stoke the boilers to heat the premises. The red-brick cylindrical tower originally had a conical roof but this was removed during the 20th Century. 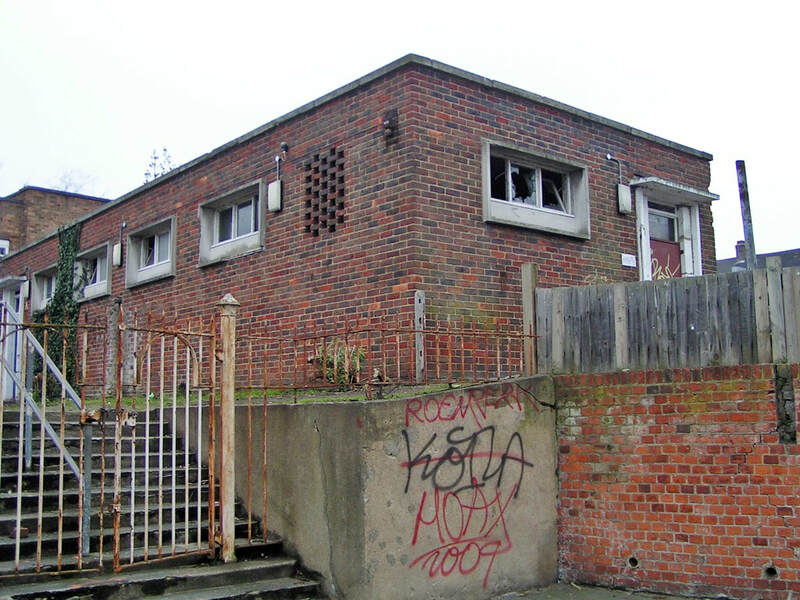 The building was last occupied by Ladywell Gymnastics Club who floored over the pool basin in the 1980s. They left in 2004. 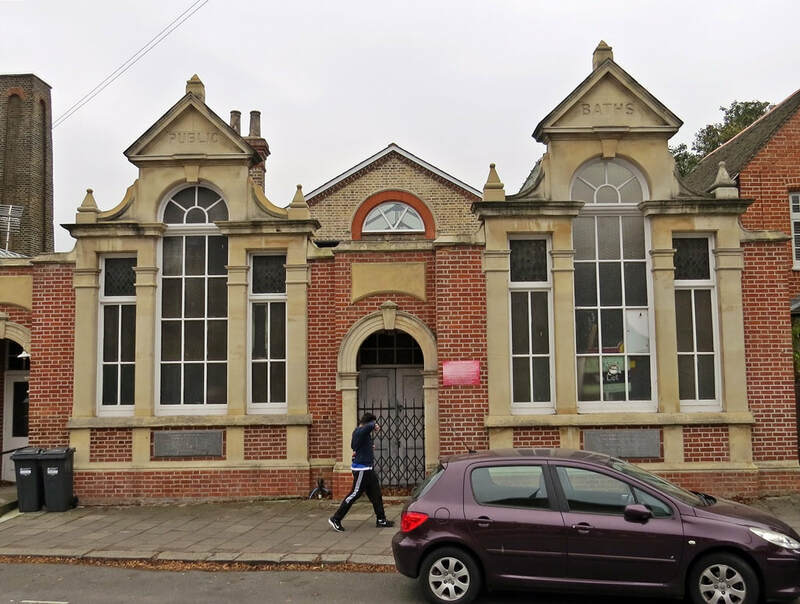 Plans to demolish the building and construct a secondary school on the site came to nothing, and the baths were then awarded grade II-listed status. 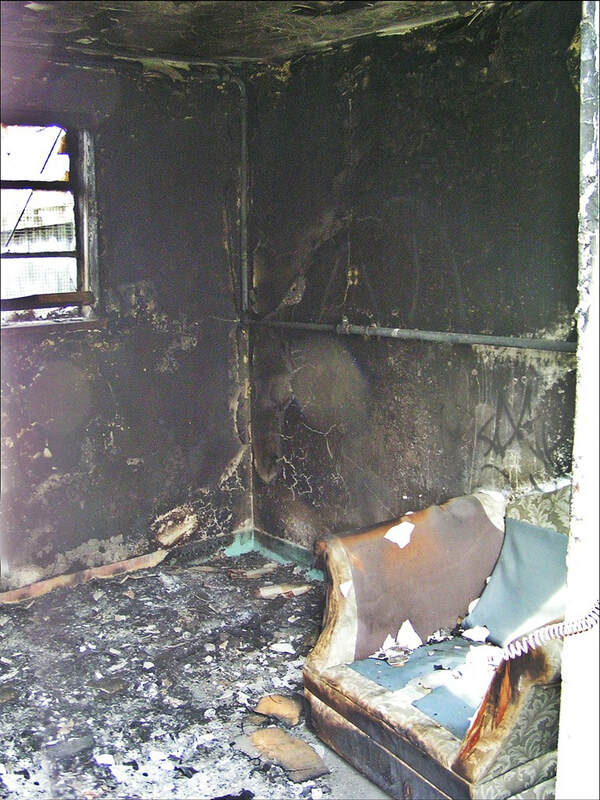 A fire in 2008 badly damaged the second-class pool hall. 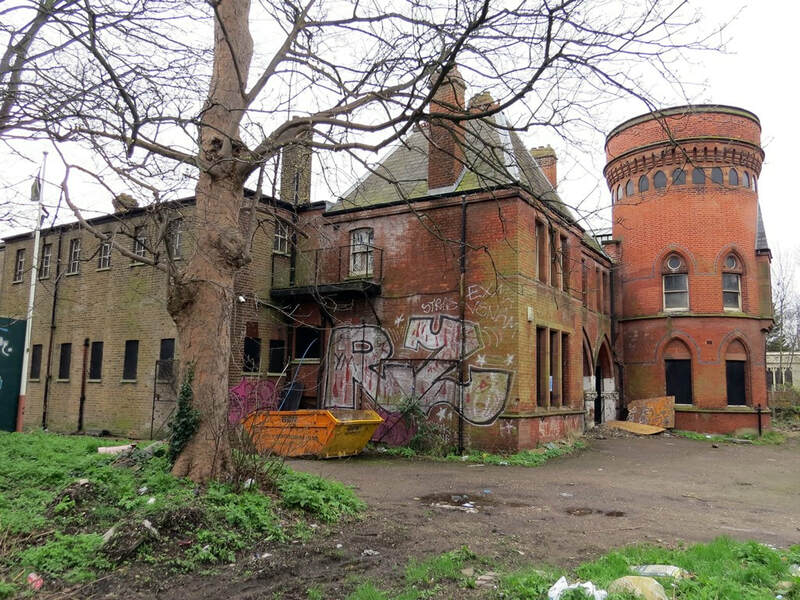 The London Borough of Lewisham, whom own the building appointed Guildmore and Curzon Cinema to bring forward proposals for the restoration of Ladywell Playtower. 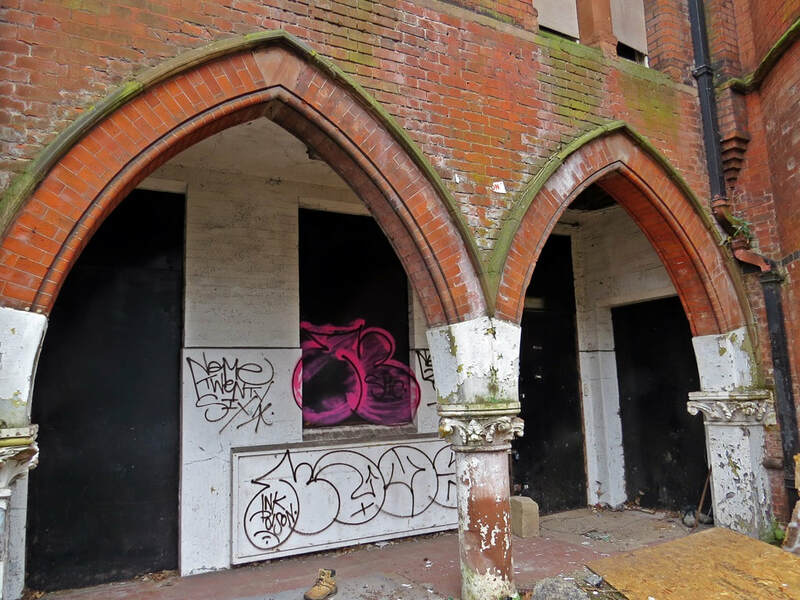 These proposals include a 3-screen cinema, complete public events foyer, café & bar with two new blocks of housing within the grounds. 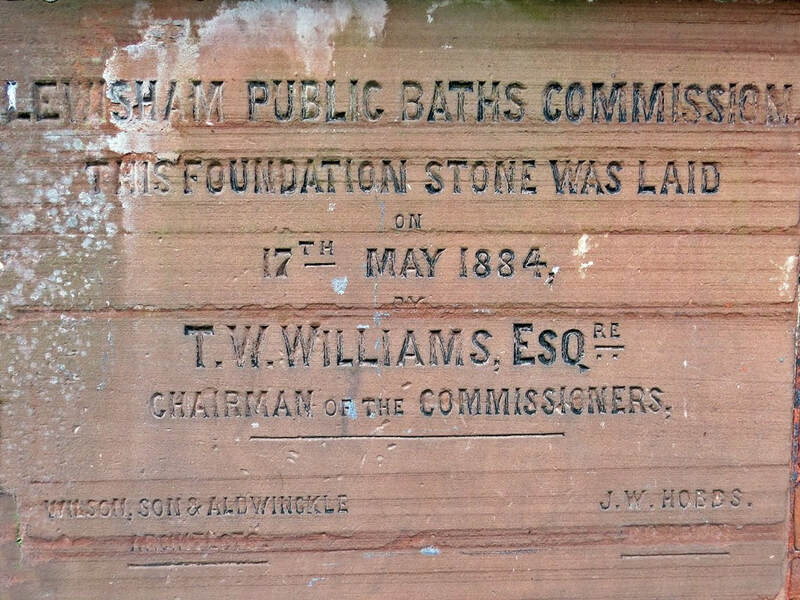 Swimming is said to have taken place at a pond on the same site the the 19th century. 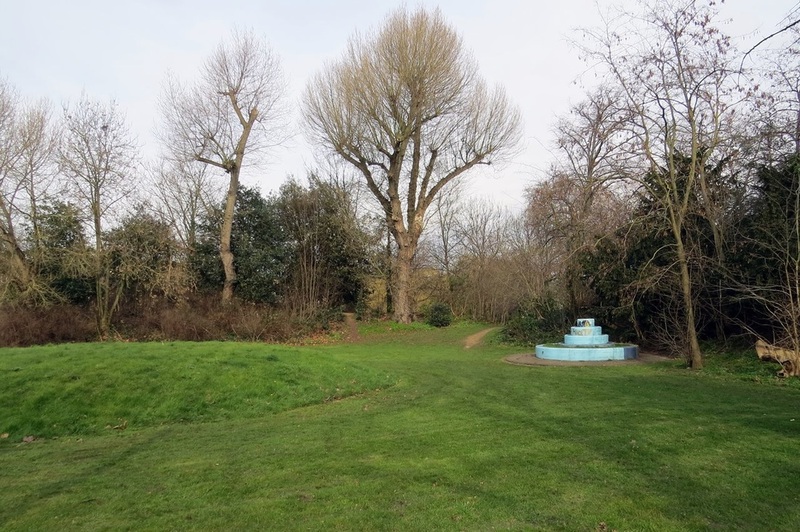 This pond was likely to have been fed by the River Peck which used to run above ground through this site. 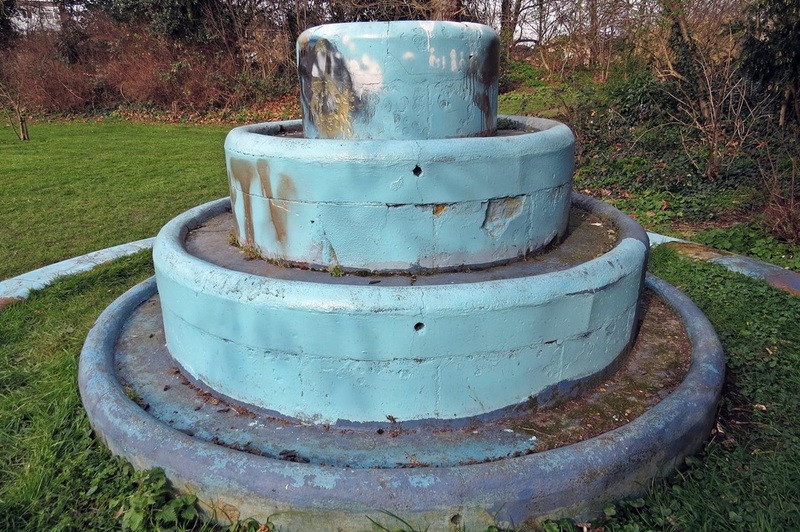 A local architect is leading a project to revive the lido with a smaller natural pool alongside it, which could draw water from the River Peck running directly under the site. 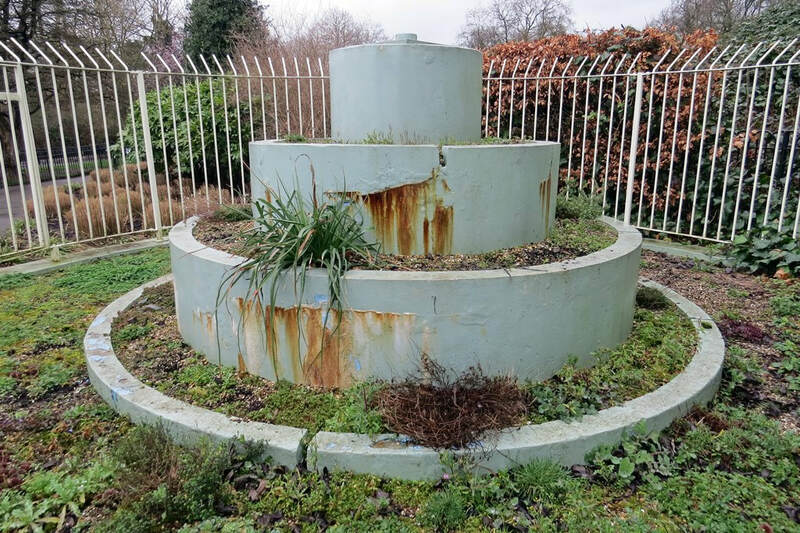 We cover the lido site on my London's Lost Rivers walking tour of the River Peck and Earl's Sluice. 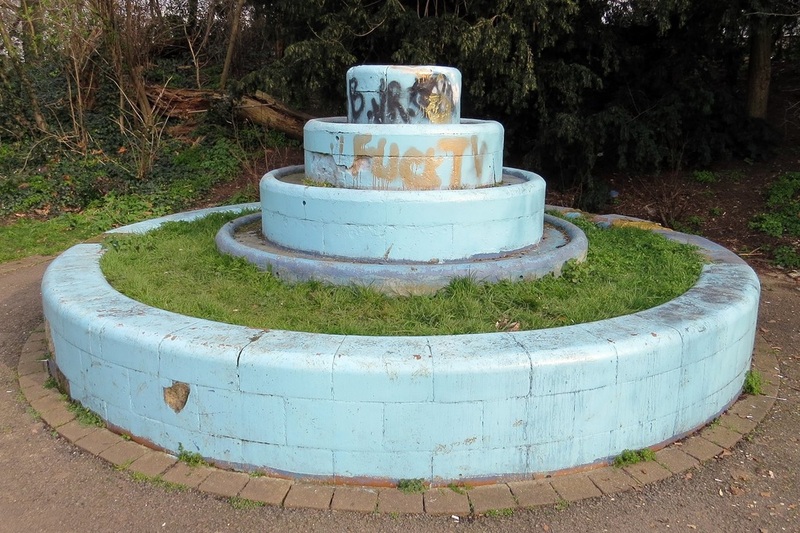 ​A similar structure remains in Southwark Park. 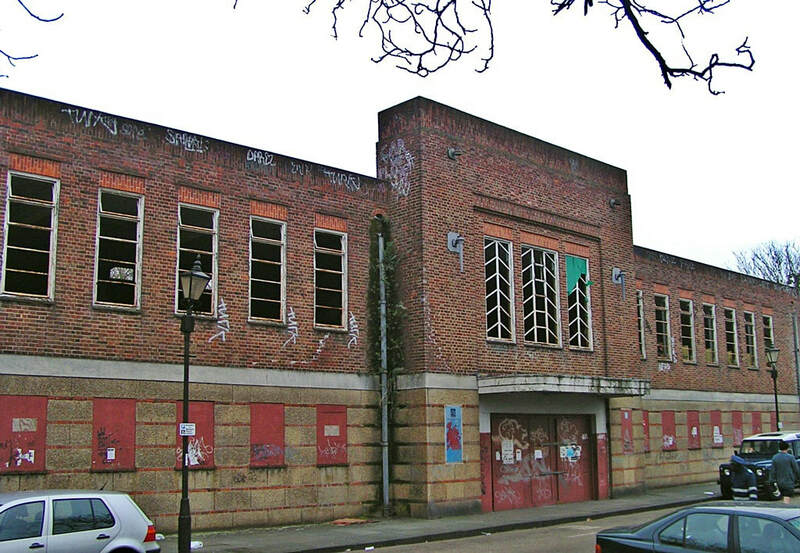 The lido there opened in 1923 and closed in 1985 according to Historic England. 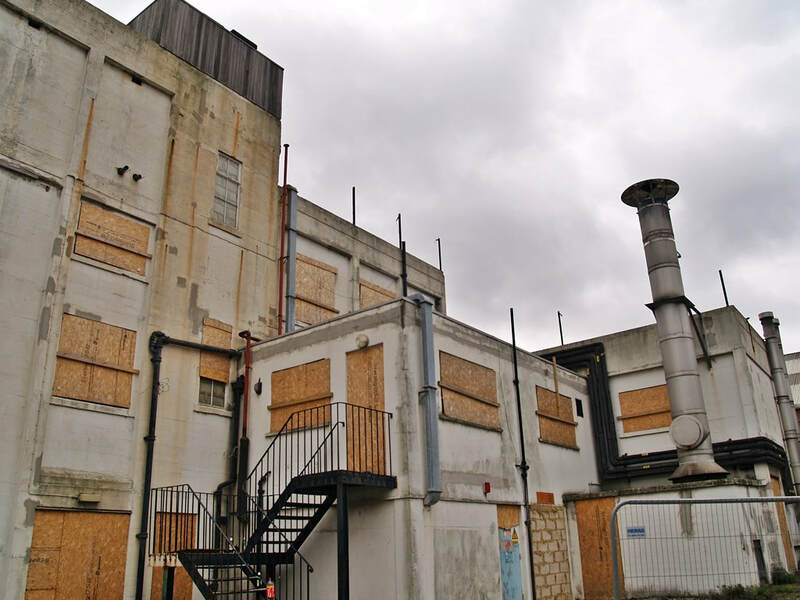 There are no proposals to reopen a lido on this site. 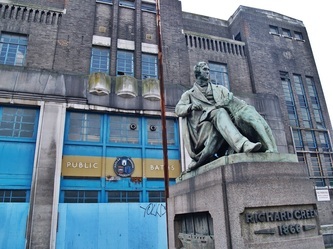 ​Poplar Baths was built and opened in 1852 following the Baths & Wash Houses Acts in 1846-47 and rebuilt in 1933.The larger pool, known as East India Hall, was floored over and used as a theatre (capacity 1,400), dance hall, exhibition room and sports hall especially for boxing and wrestling programmes. 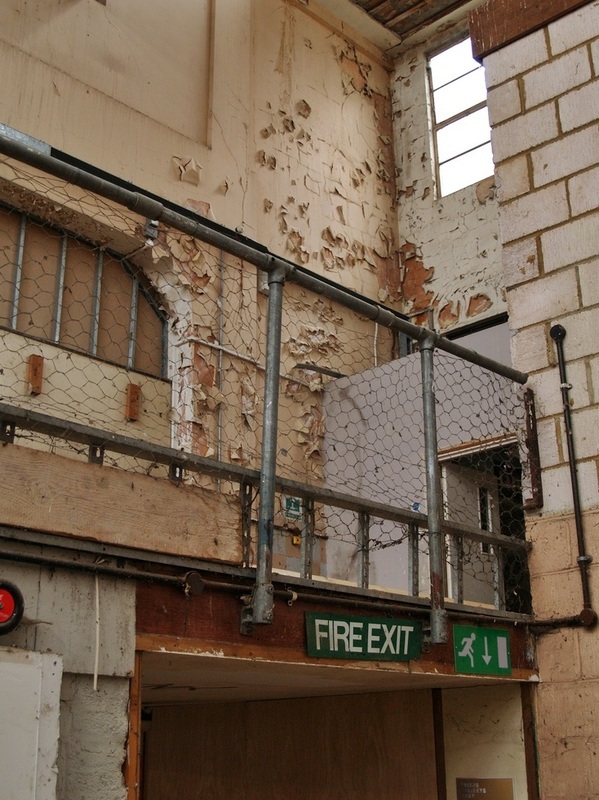 Wartime bomb damage forced the closure of the hall until 1947 when following required works, programmes resumed. Between 1954 - 1959 there used to be an average of 225,700 swimmers each year. In the 60's more sports were introduced to the Main Hall. 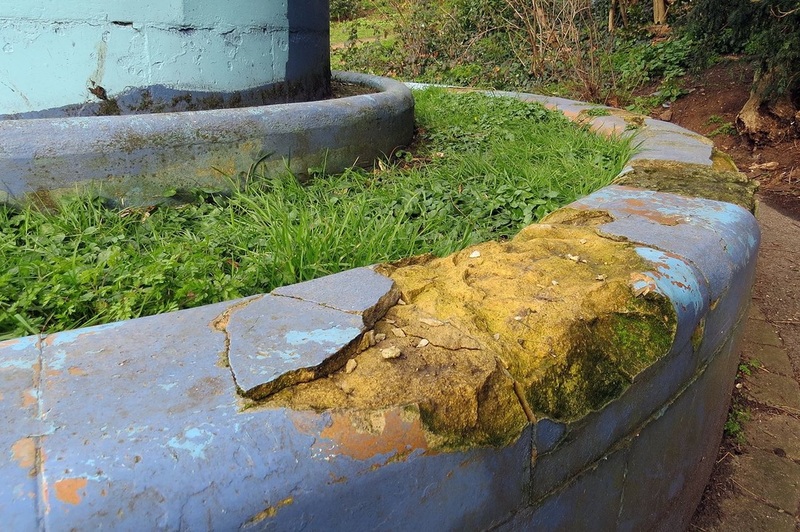 However, poor repair, lack of investment and the changing nature of leisure with the revolutionary change in swimming pool design meant that when structural repairs were required on the roof in 1985, it was the beginning of the end. 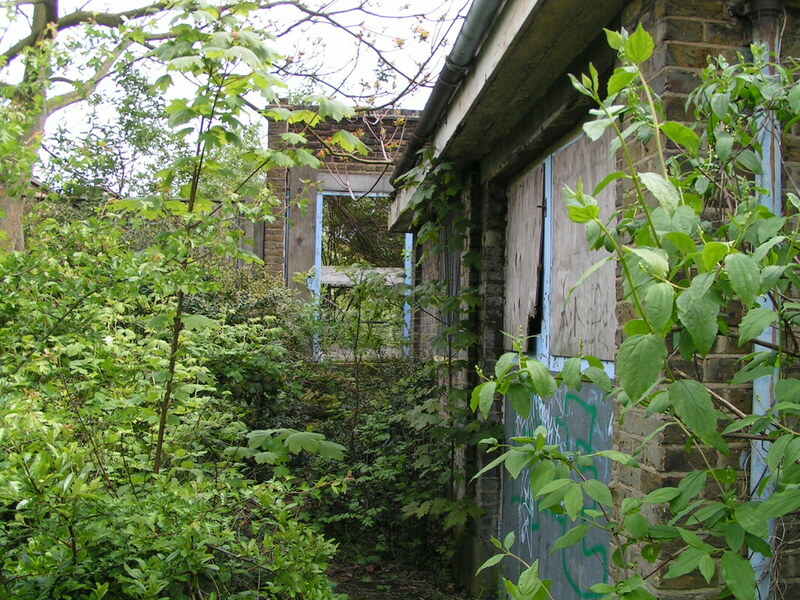 The baths remained empty, home to pigeons and drug addicts and seen very much as potentially a very valuable Poplar resource, which was being watched very carefully by people living on either side of the A13. The statue in front of the building is that of Richard Green (and his dog), a Victorian shipbuilder, ship-owner and local philanthropist. 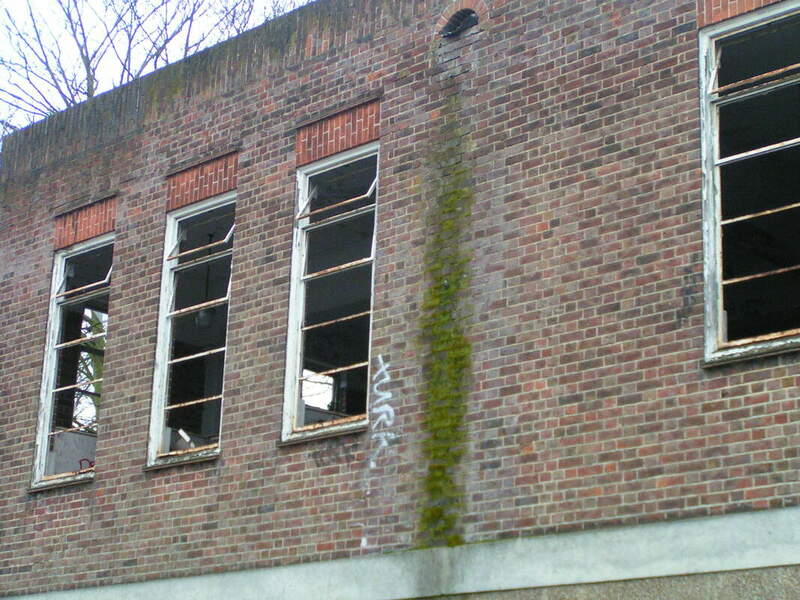 Below are a few more pics of the derelict Poplar Baths in 2007. 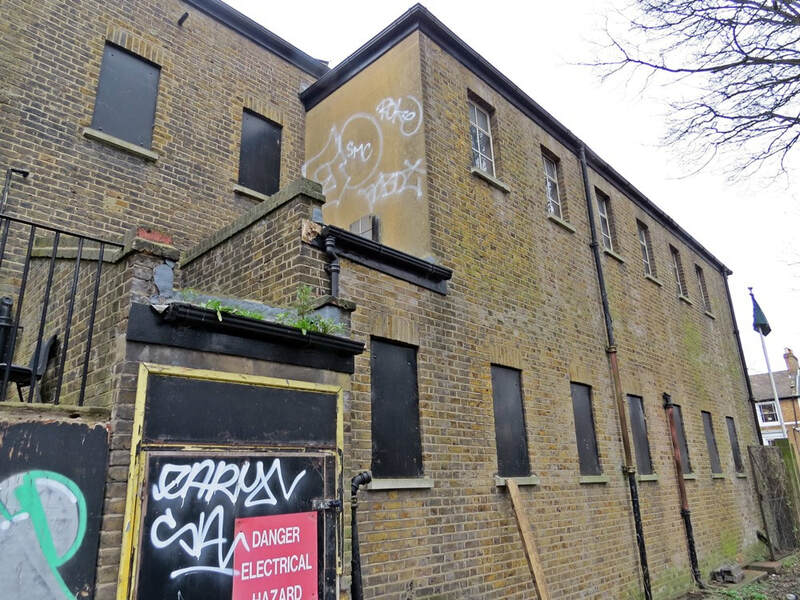 ​Chris Duggan writes to Derelict London: "My family lived in a row of houses located down the alley alongside the baths. From when I was aged about 14 in 1959 until only about 8 years ago when my brother who had purchased the home from the council sold it and moved on When I was aged about 18 we had a garage directly behind the baths in which my younger brother and I kept a motorcycle and a Scooter This was back in the Mods and Rocker days my brother was the mod and I the Rocker. When aged about 18 a friend worked as a lifeguard and as he new the Boiler man we could gain access through the back doors after hours often with girlfriends and indulge in some skinny dipping. 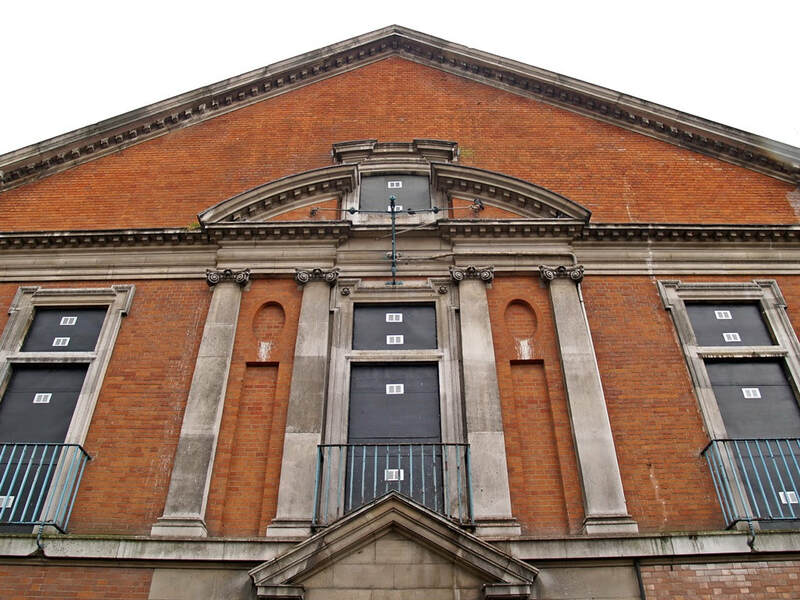 Thanks for the memories"
In July 2012 Poplar Baths welcomed the general public for the first time since its closed its doors in 1988. 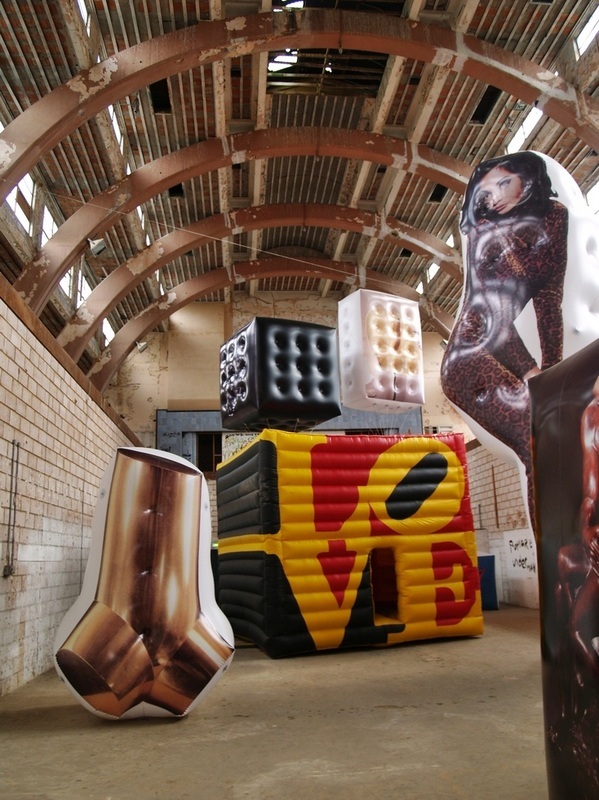 Arts company Frieze held an exhibition of giant inflatable sculptures which filled the empty swimming pool. 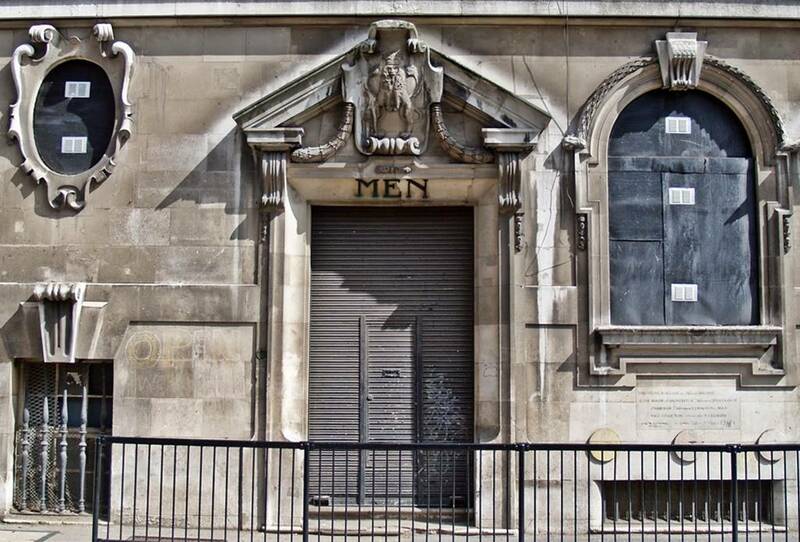 ​The first public baths were built on the site by the Vestry of St James in 1850 and the present building, then known as The Westminster Public Baths, was started in 1928 and completed in 1931. 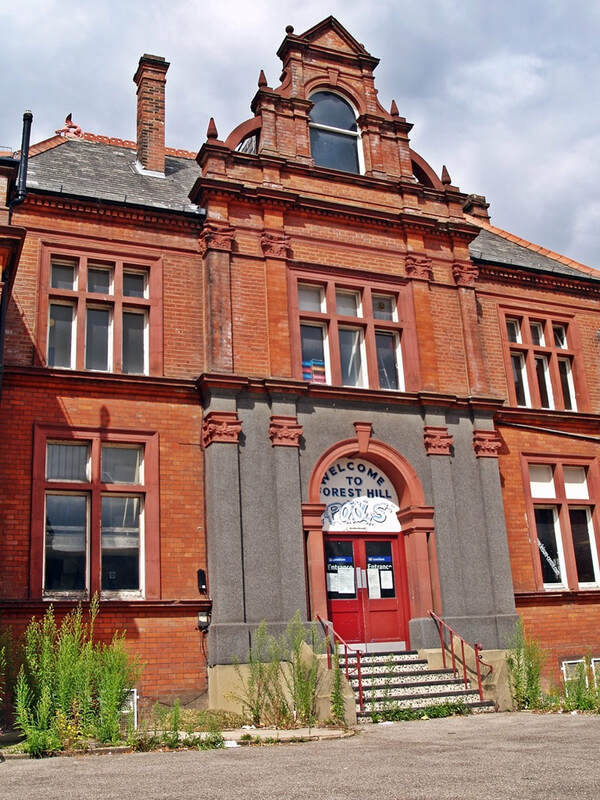 It was built with public funds for the health and well being of local people. The main pool is lined with white Sicilian marble and this marble and Swedish green marble are used on the walls at either end. Behind the pool was a smaller pool, the 'second class bath' which also had a barrel vaulted roof. 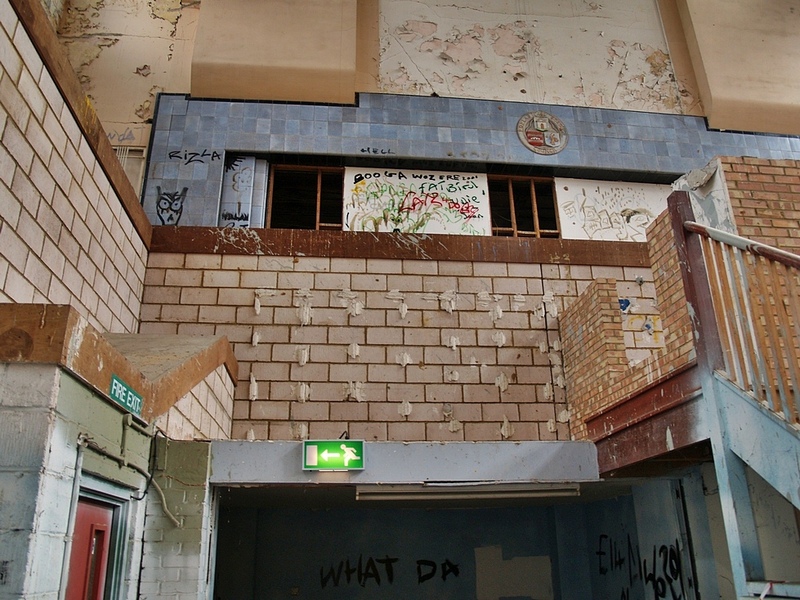 When built the complex also included a child's welfare centre, a public laundry and public bathing facilities. 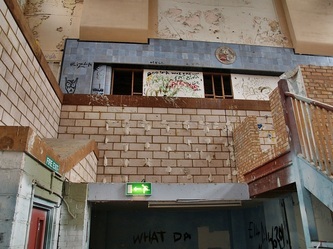 It closed in 1997 in response to 'safety fears' and reopened in 2010 after a £25m refurbishment. Teresa writes: "I was working nearby in the 1980s and remember there was a grand re-opening ceremony in 1987 when it opened after a revamp. 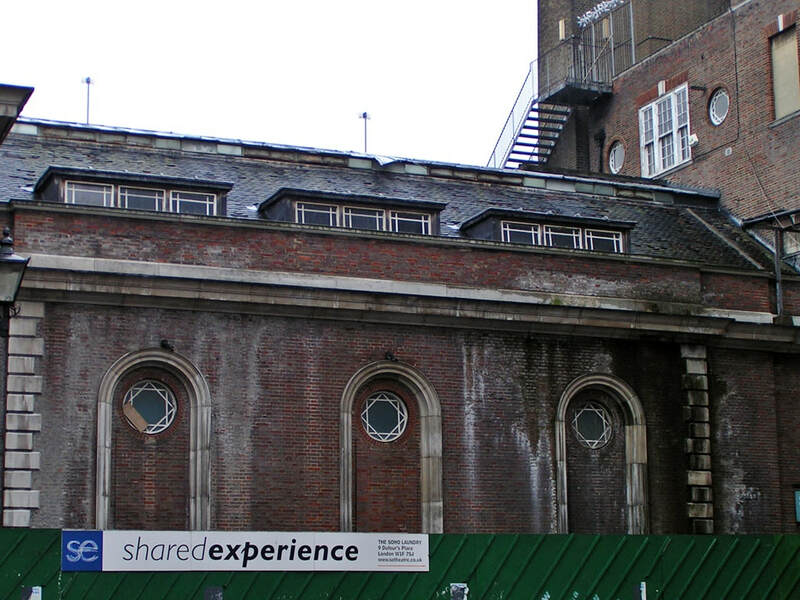 It had been closed for nine years because of a structural fault in the barrel-vaulted roof. 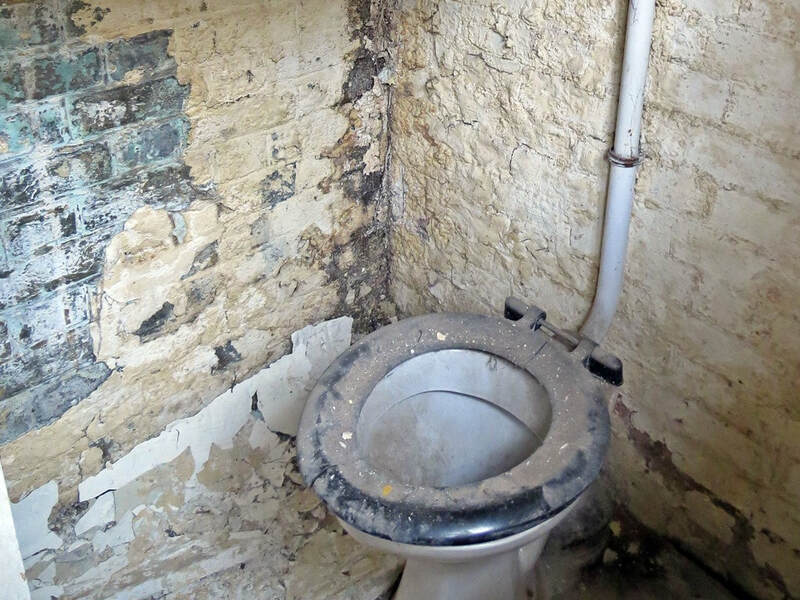 I still have the newspaper article about it which says that Westminster council spent almost a million pounds on the revamp. What I want to know is why did it close all over again only ten years later, and I hope that million pounds was not wasted?" 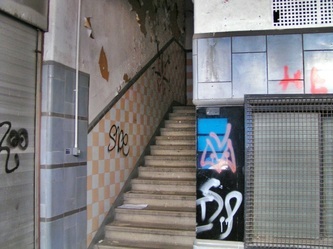 Below are some more pre-renovation pictures of Marshall Street Baths taken in 2004. 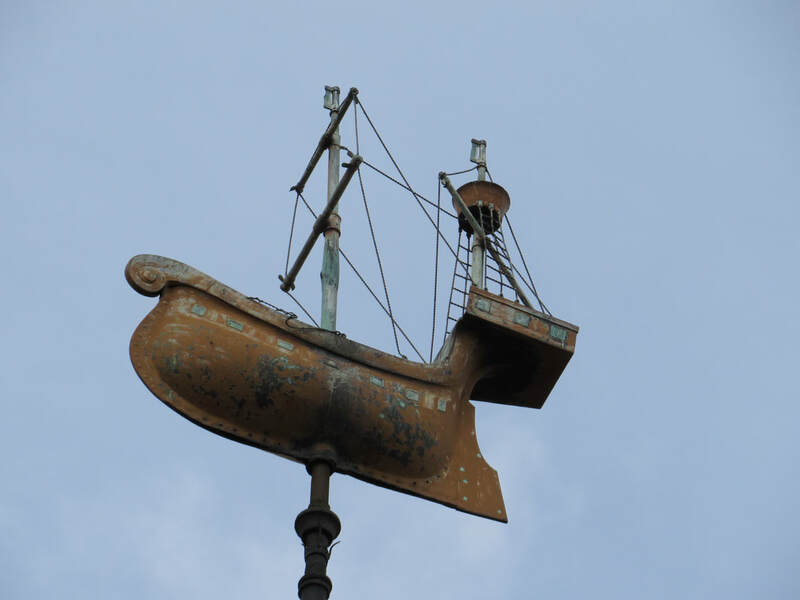 This attractive building topped with a weathervane in the form of a ship opened in 1904 featuring one pool in a large barrel vaulted hall, slipper baths and a laundry at a time when local houses did not have their own baths. 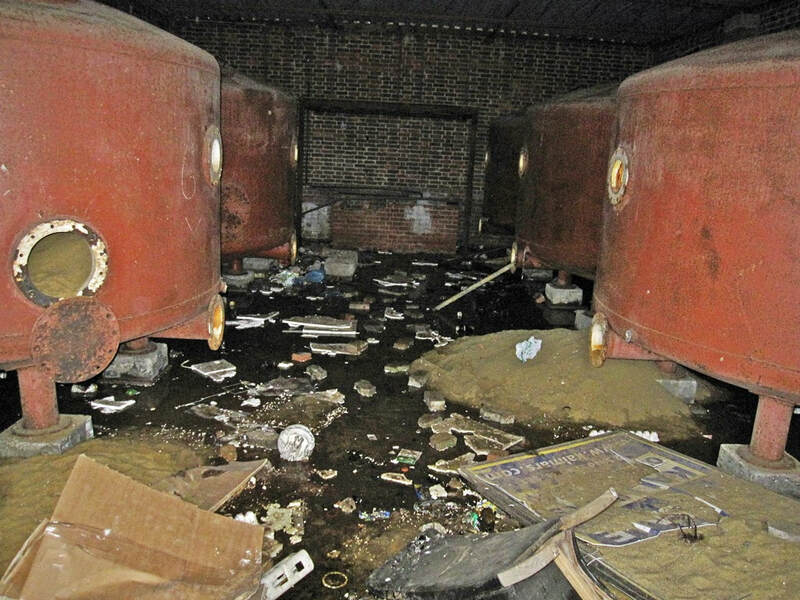 The original coal-fired boilers that heated the water were rumoured to have been salvaged from a ship. 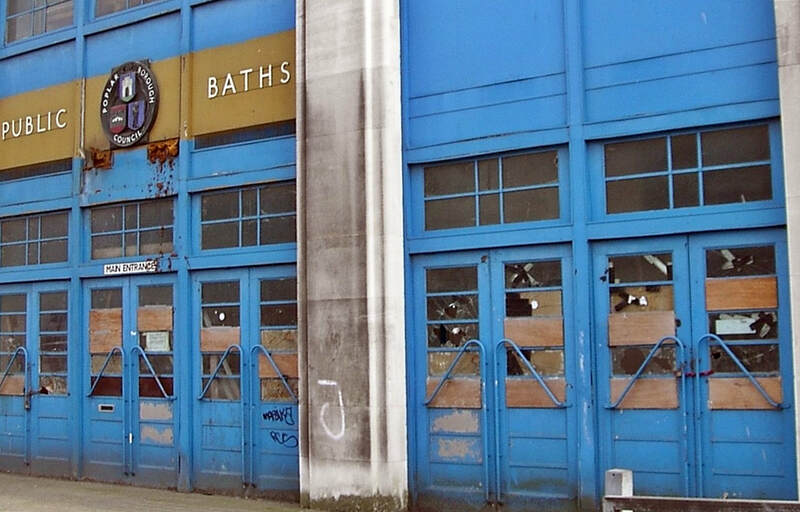 The Baths closed in 2000 following health and safety concerns by Hackney Council among accusations of neglect from locals. 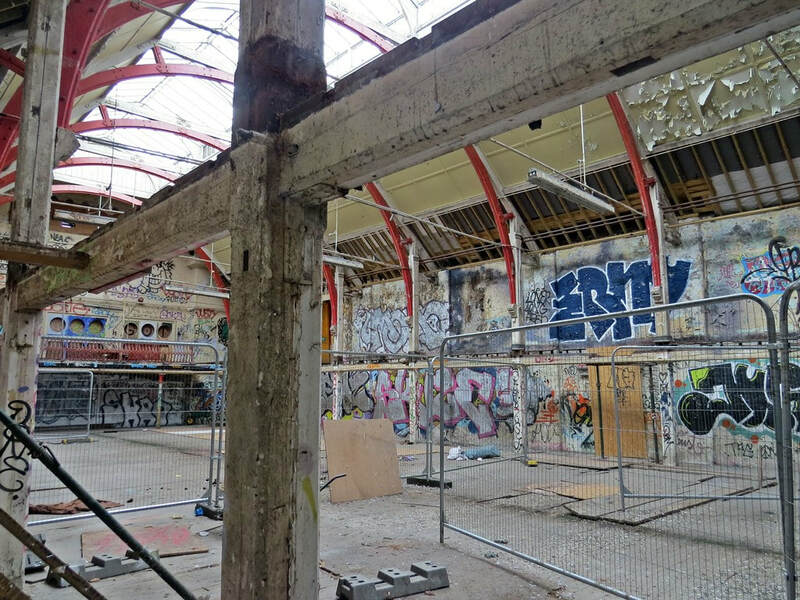 Various schemes to save the Baths have failed to come to fruition and large sums of money spent by the Council on keeping the building secure. 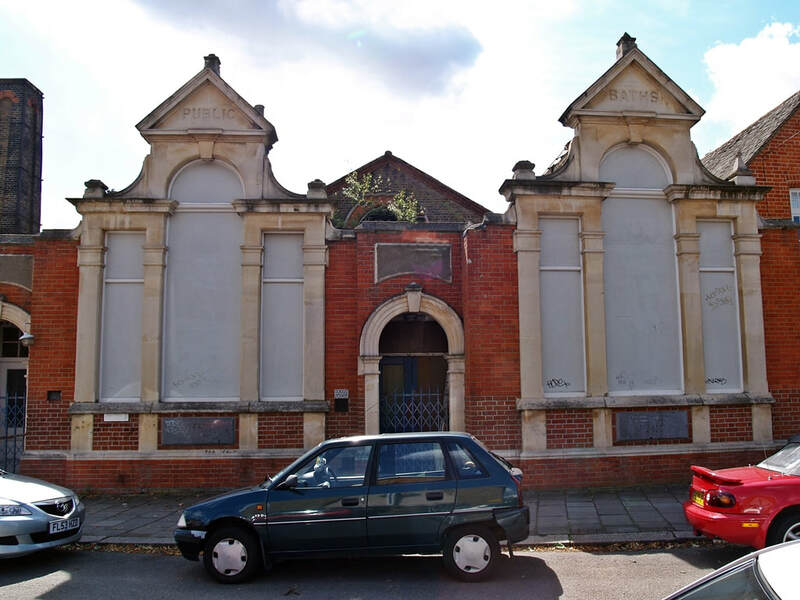 After failing to find anyone willing to invest in bringing the building back to life as a swimming pool the council have finally agreed with a developer to renovate and convert it to house businesses, shops and a community hall. 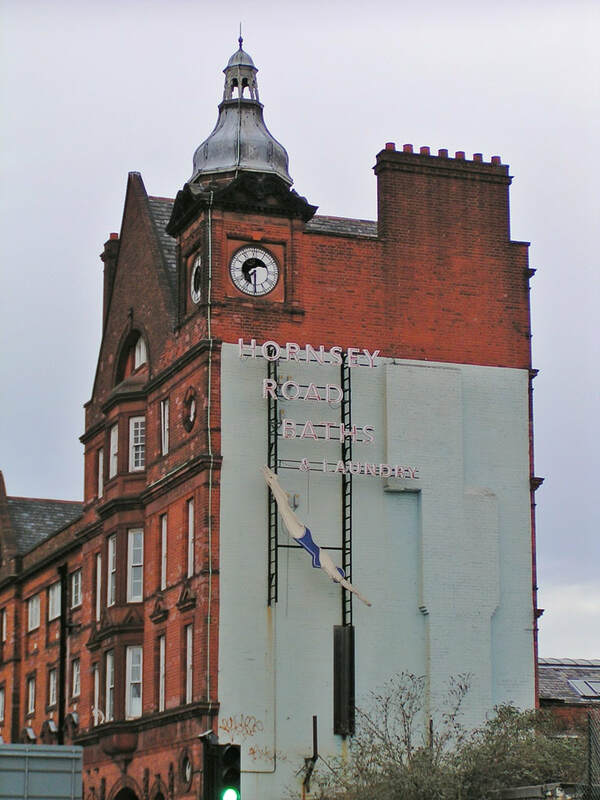 ​Janet Entwistle writes: "I lived in the flat at the top of Haggerston Baths from 1946 to 1954. We moved down from Yorkshire when my father (Mr West) was appointed as manager. I was just six years old and grew up in a magical place full of exciting things to do and wonderful people. I spent hours with 'Auntie Gertie' in the ticket office, 'helped' the swimming pool attendants, ran hot baths in the mens' slipper baths, shovelled coal for the boilers and collected our soap powder from the laundry. Haggerston Baths was my home. 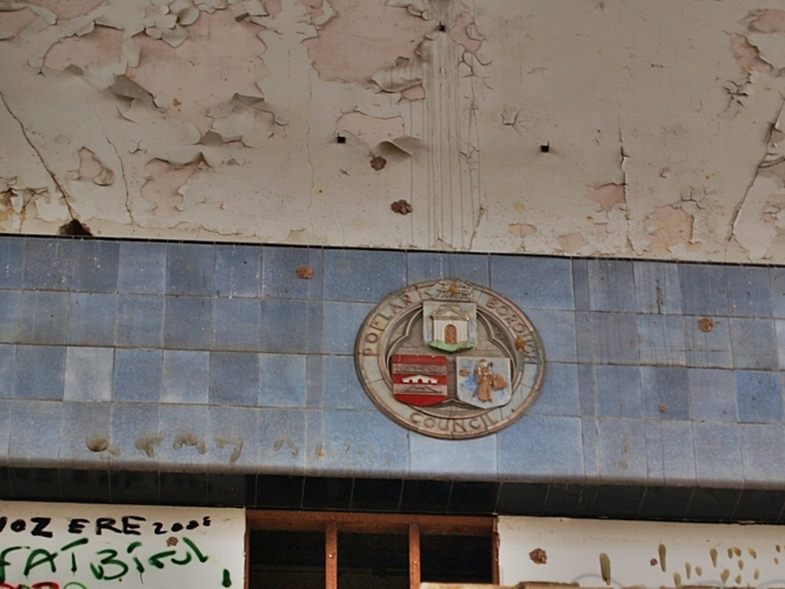 The building suffered damage in the war and when we went there the pool was in need of repair. The Mayor came to the grand opening and my mum, who was in her fifties, and her friend (who were both swimming instructors) gave an aquatic display." 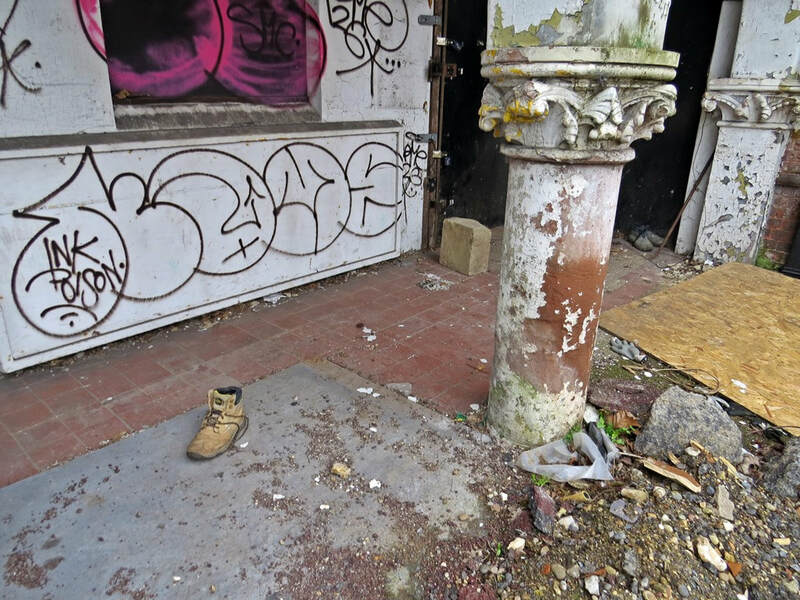 ​Ken writes to Derelict London: "I was "born and bred" in Shoreditch, your pictures of Haggerston Baths bring back many happy teenage memories, "posing" on the top diving board in white swim trunks and keeping an eye open for any unaccompanied girls." 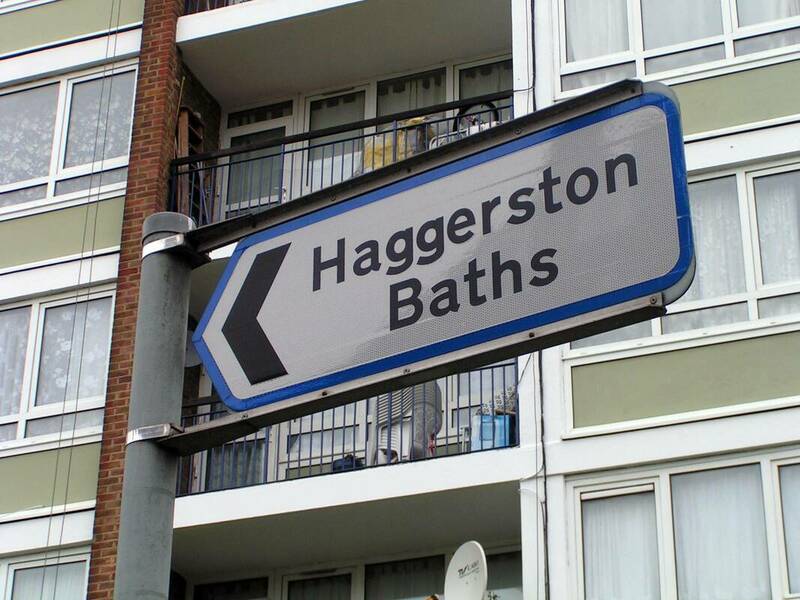 ​James Cassidy writes: "Living on Whiston Rd as a young lad in the Sixties, I also remember Haggerston Baths pretty well. Not just the swimming pool, but the massive old laundry that was on the site as well, where the local women would do the weekly wash in a haze of steam. The giant mangle for drying off sheets really sticks in my mind. It required at least 2 of the women to hold the sheets and pass them through the rollers, and it wasn't unknown for a finger or 2 to get squashed in them!" 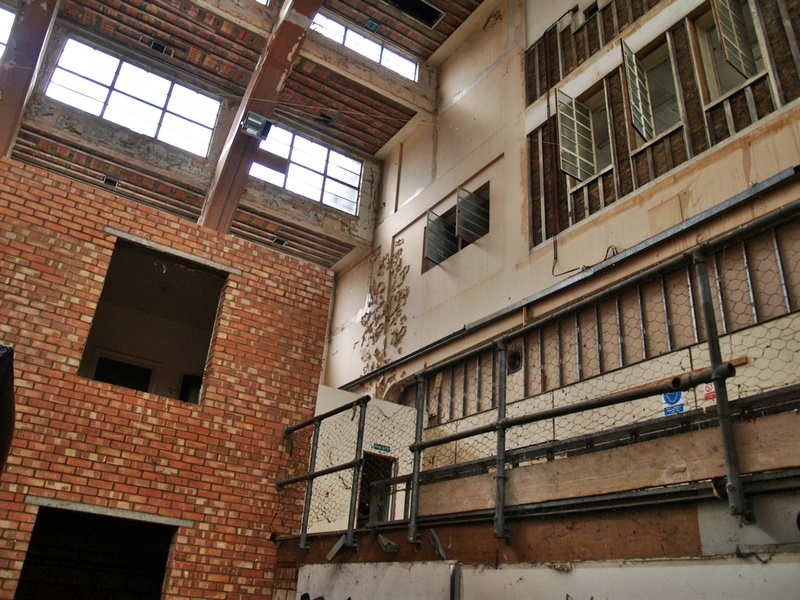 Below are a few more pics of the derelict Haggerston Baths between 2003 and 2012. Meanwhile, the nearby Clissold Pool, costing £32 million that opened 2 years after Haggerston Baths shut down, closed after only 22 months of being opened!, "a state of the art sports facility in one of the poorest boroughs in the country, the design was paraded around the the world by the British Council, the Foreign Office and the Millennium Commission...meant to symbolise a brave new century and lauded as "prime examples of the excellence of British architecture and design.. the aluminium and glass complex hailed for its "functional modernism" - was shut on safety grounds. 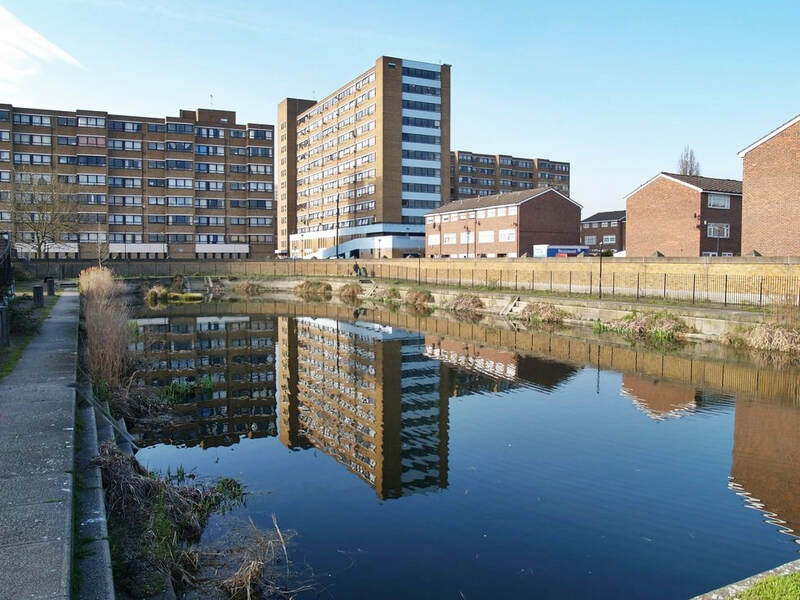 The centre, in Hackney, "was plagued by flaws which have seen walls cracking, roofs leaking, water pouring into the electrical fittings and drains backing up. 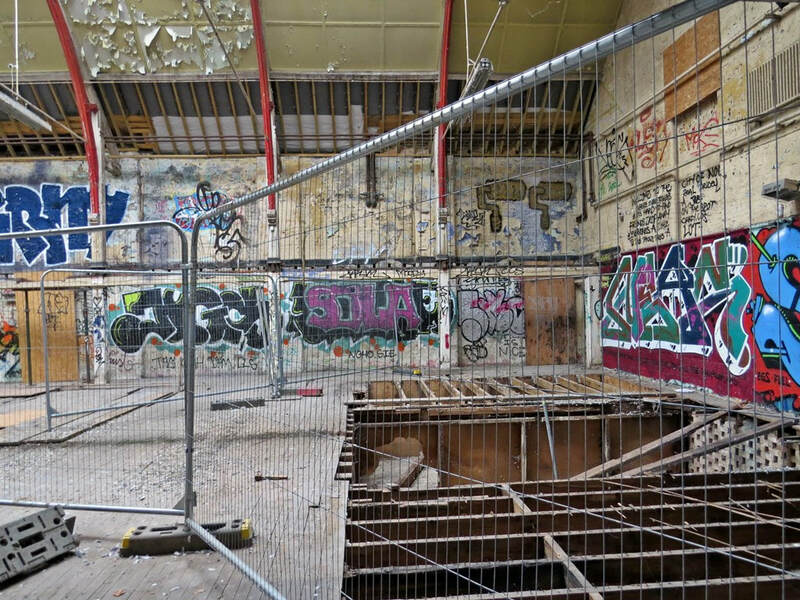 The showpiece swimming pools are seriously damaged and the walls of the squash courts are crumbling." (The Guardian Feb 2004). 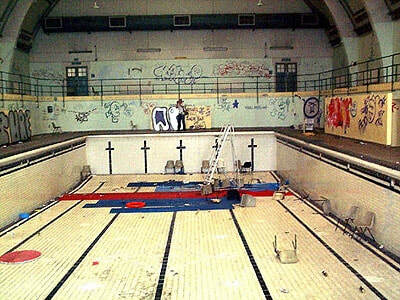 Clissold Pool finally reopened in 2007 overall costing £45 million in total. 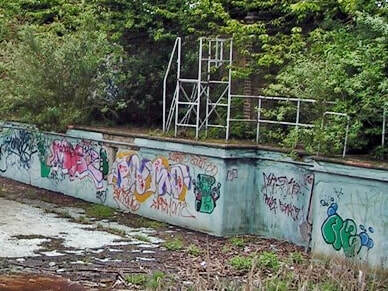 ​The Pools opened in 1885 in a Victorian crusade for 'health & safety'. This was to bring baths and clean warm water to many parts of the growing population in the area who had no or limited access. 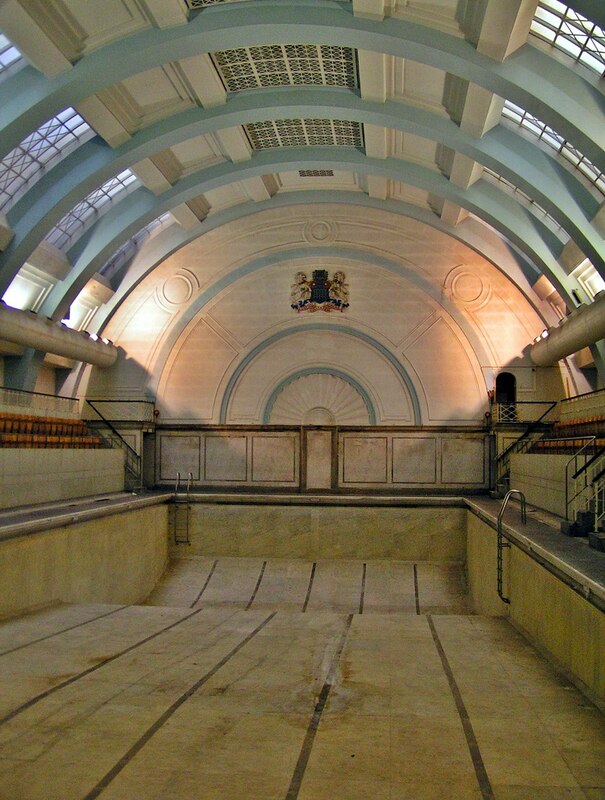 The Pools also had 'slipper baths' specifically to enable people to have a bath in private. It also had upper class and working class pools. 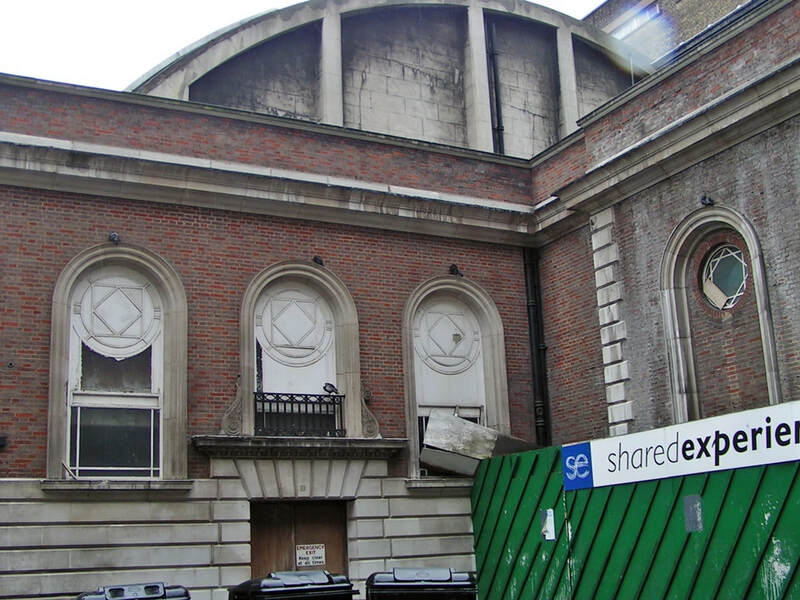 This pool, believed to have been the oldest working swimming baths in London was shut down in 2006 due to structural concerns.Most of the building was demolished in 2010 with only the Victorian entrance retained. A new leisure centre was built on the site and reopened in 2012. 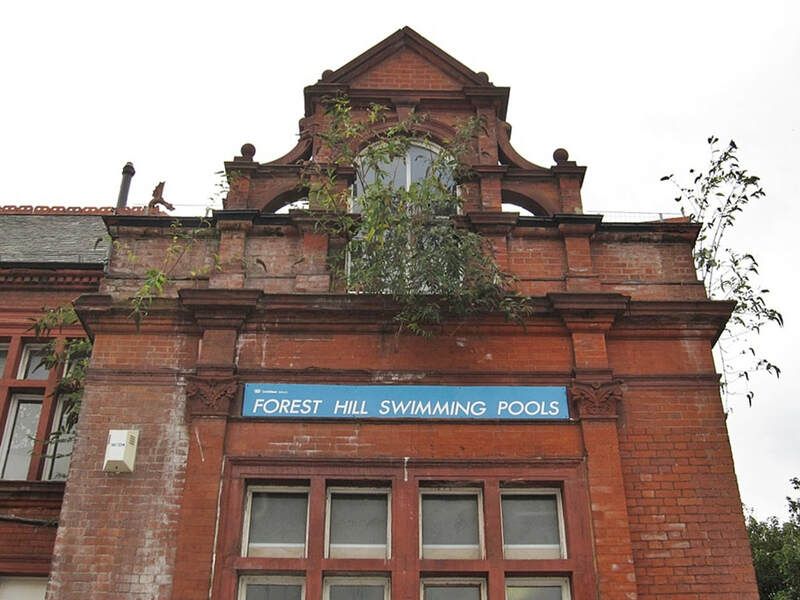 Forest Hill Pools was home for Linda Ludgrove, Commonwealth Gold Medalist & World Record holder 1962-67. 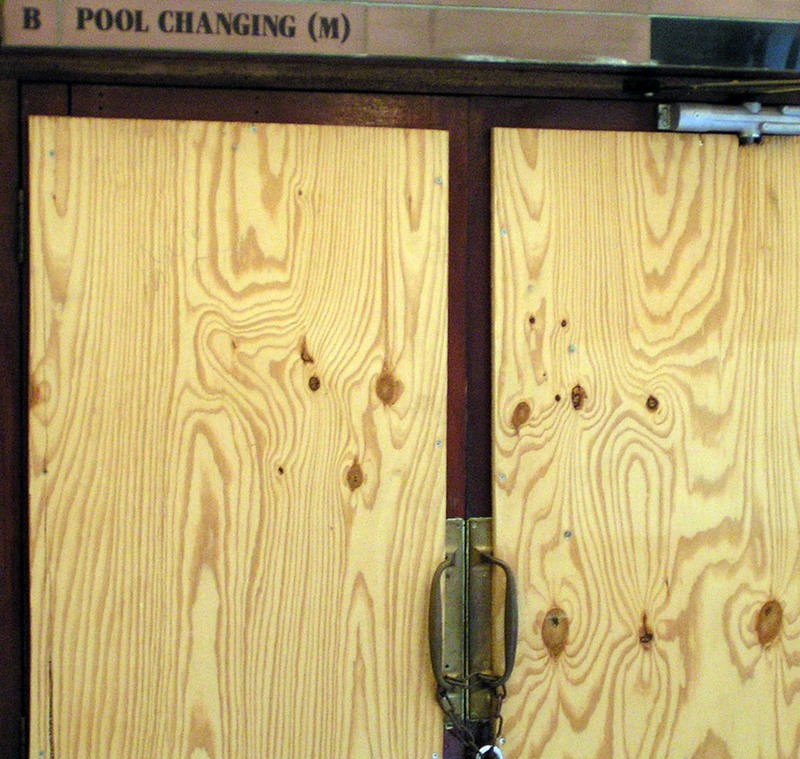 Someone recently told me that cockroaches were spotted in the late 1990s in the changing room and pool area. Eltham Park Lido officially opened in 1924. 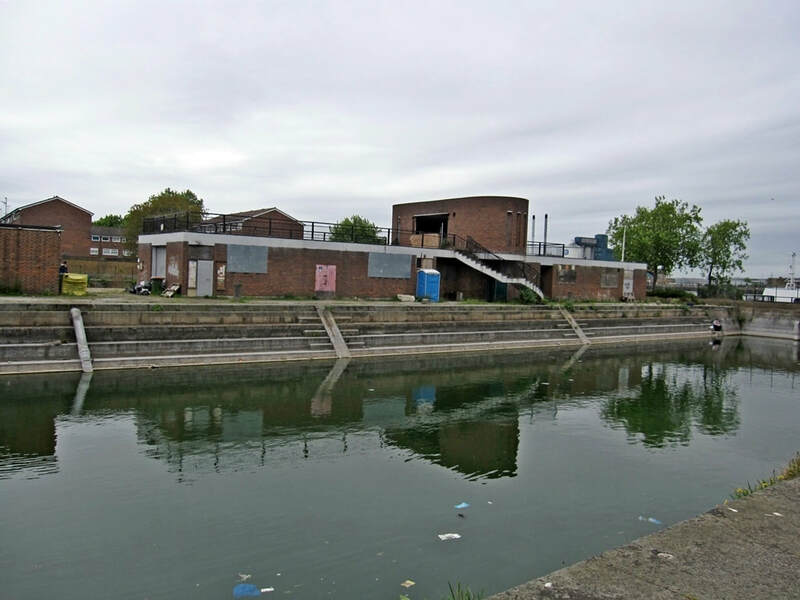 It was used by the Eltham Training and Swimming Club, which undertook long distance swimming including Cross Channel events. 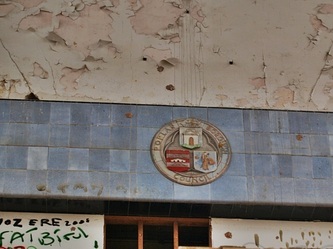 In 1988 it shut due to local council spending cuts and after a new A2 Relief Road was built nearby causing subsidence. 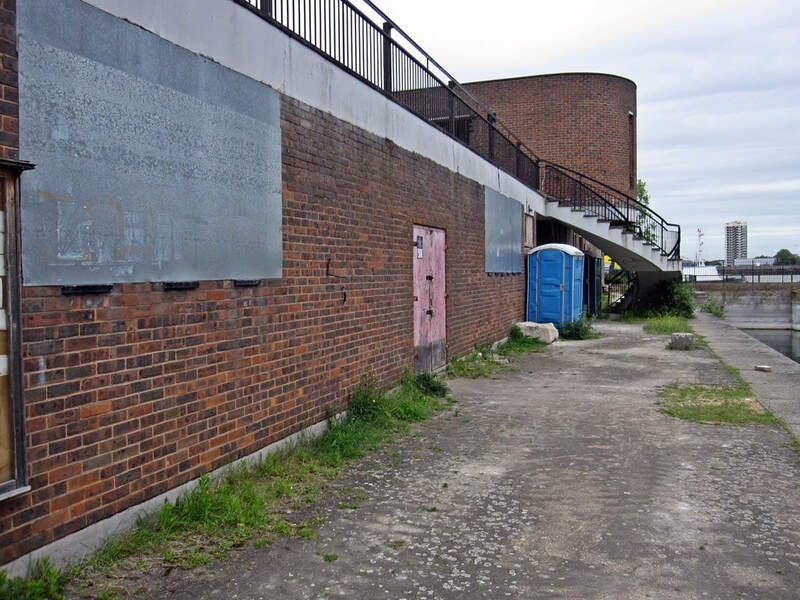 A plan by the community ('Splash') to bring the lido back into use was turned down by the Council and later there was a failed plan by the Lawn Tennis Association to build an indoor tennis centre on the lido site. 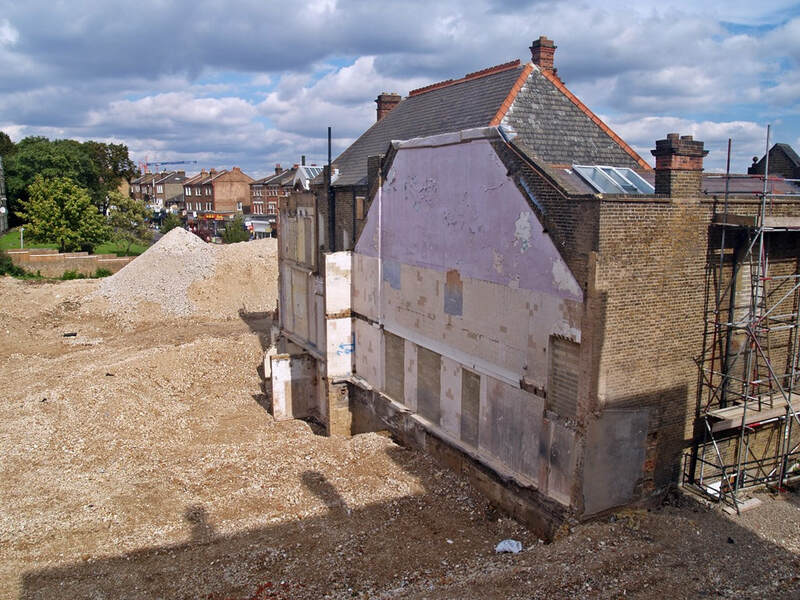 The lido was infilled and buildings demolished and the site grassed over. 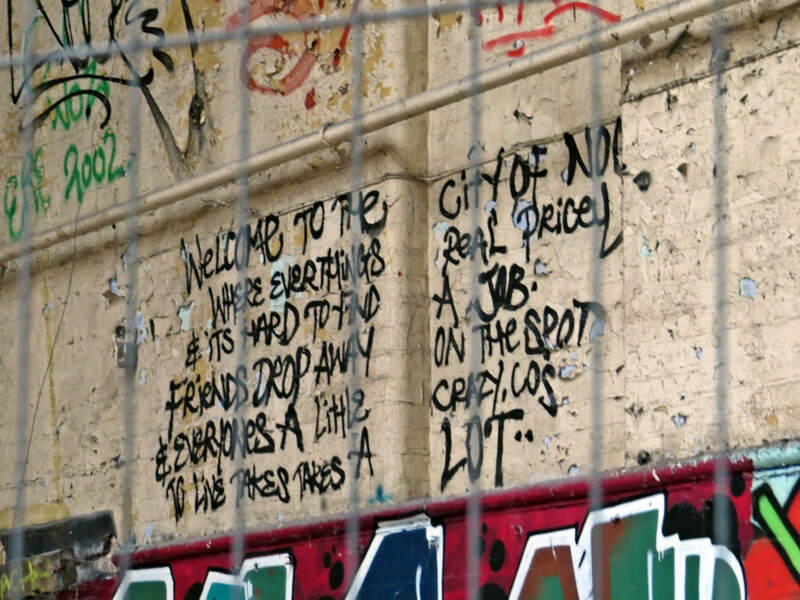 Jonathan writes to Derelict London: "I remember about 24 years ago myself, my mate, and two birds we met over the CB going skinny-dipping there at about 11 at night, in the summer - it was packed out! We had to climb over the wall and the water was absolutely freezing! Everyone was whispering to avoid drawing attention to the locals - quite surreal! 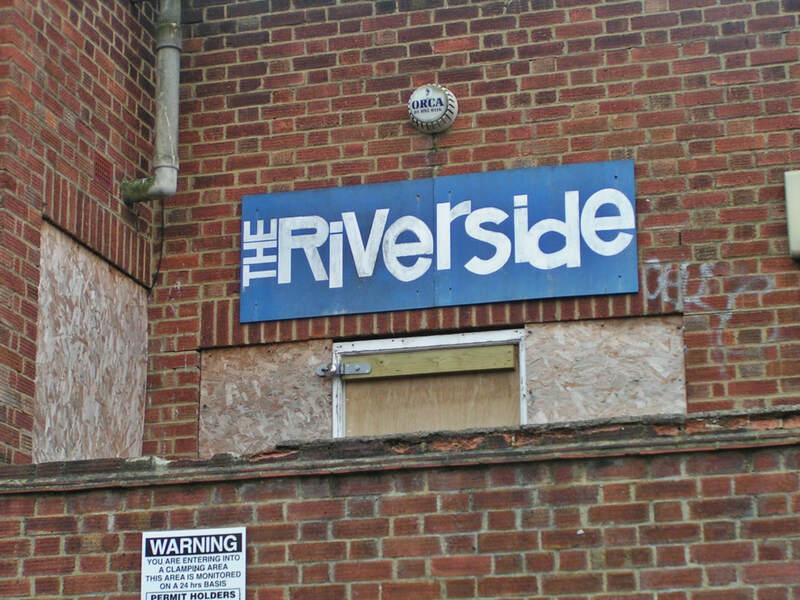 As we drove off from the nearby Car Park we saw a posse of Police cars heading in there and we later found out that they busted the place!" 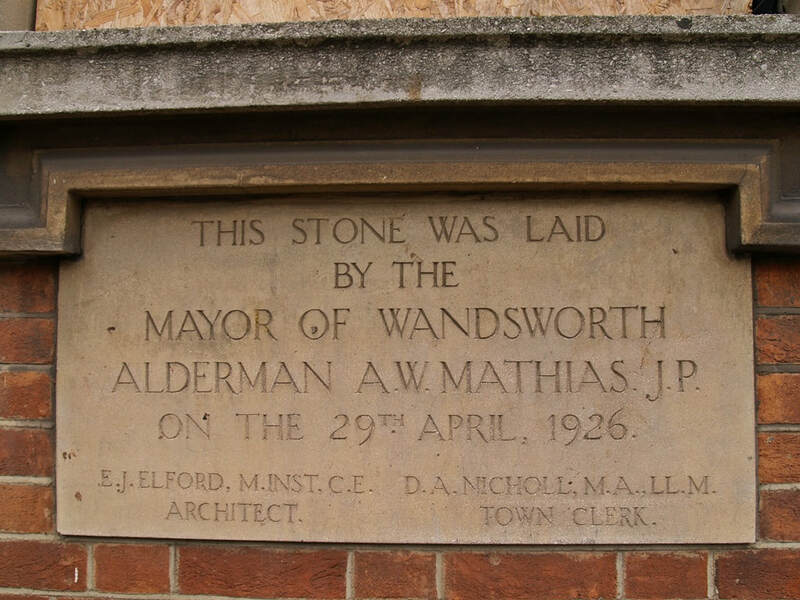 Mark Elson writes "My father was the head supervisor of Eltham Lido in the early to mid sixties. 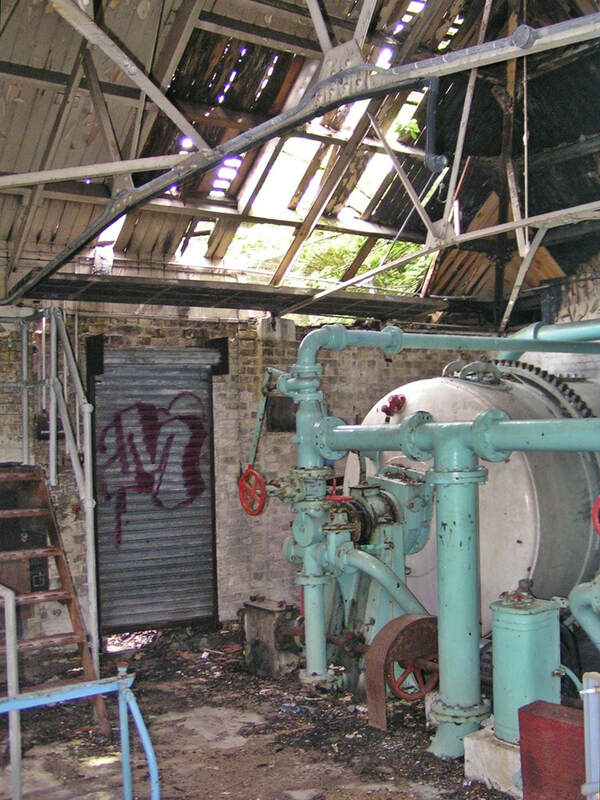 I remember the boiler room, being very noisy when he 'back washed' the system, as a small child I was quite frightened it would explode. I would spend all my school holidays in & around the pool, There was a fountain around a sun deck at the end & a double sided cafe which served both the pool users & the surounding park area. 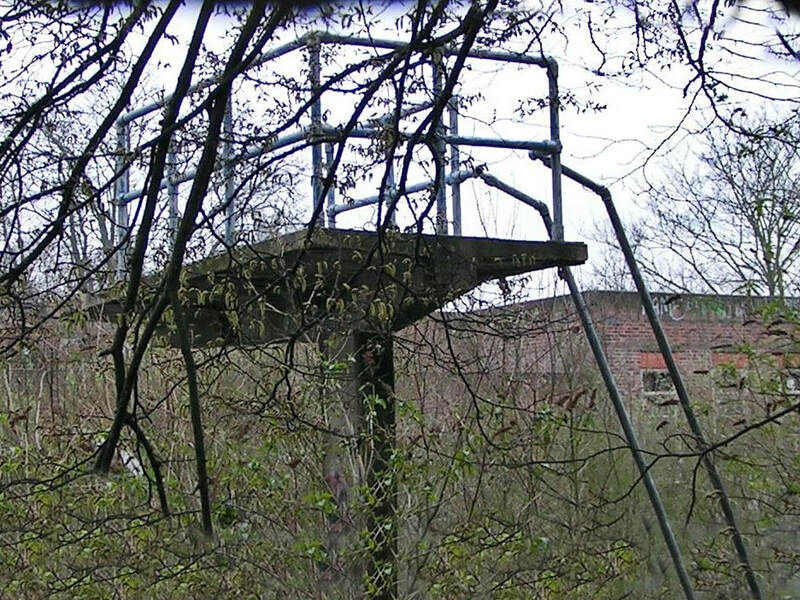 Even though I was a small child, I can still remember which room was for first aid, which was the staff room & which was the locker room, this was full of wire baskets (approx. 2 ft x 1 x 10ins) into which you put your clothes & the staff gave you a numbered disc & put it on a shelf for you. My father left when the threat of the relief road was planned & I understand it was shut for a long while before it was eventually built. 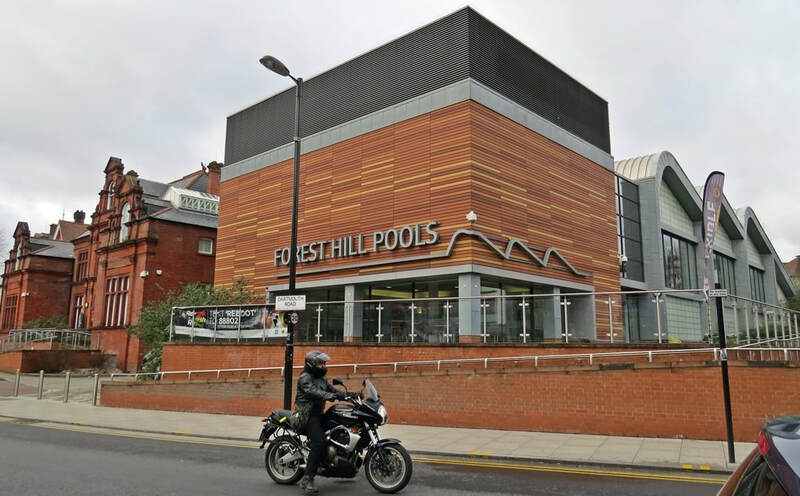 For me, it was a great place to grow up & I have fond memories of the pool, it seems such a shame that this amenity is lost to the local population." 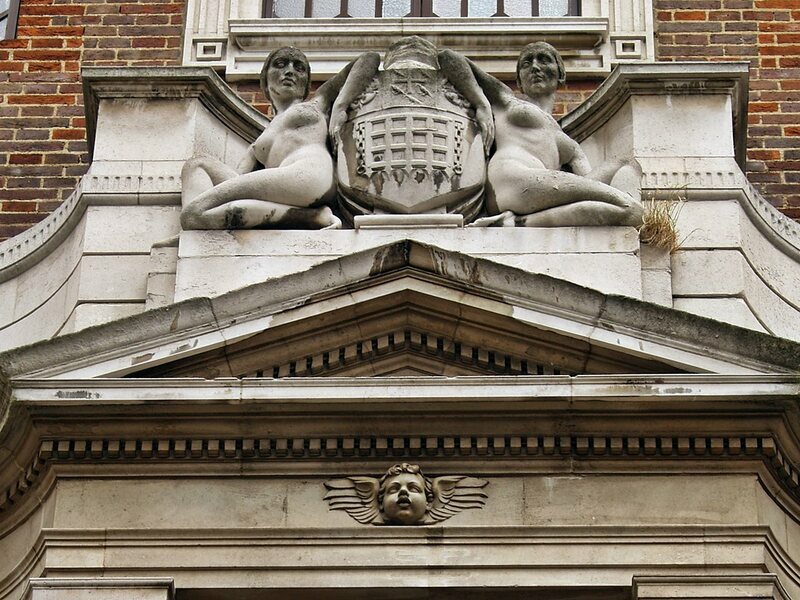 Built in the 1930s, in a concrete and brick art deco style, Twickenham Baths was municipal architecture in the grand sense with its wide hall, twin staircase and deep arches. 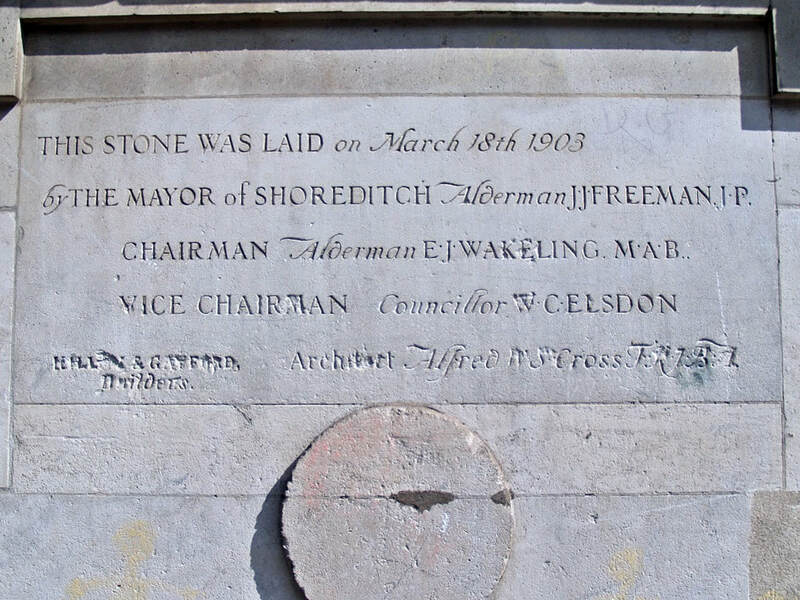 It occupied the site of Richmond House, which was demolished in the 1920s. The pool itself was an old-fashioned Lido, the last word in leisure, generously proportioned and with ample room for sunbathing on the paved areas. There were fountains at each end of the pool and a diving board at its deepest point, in the middle. 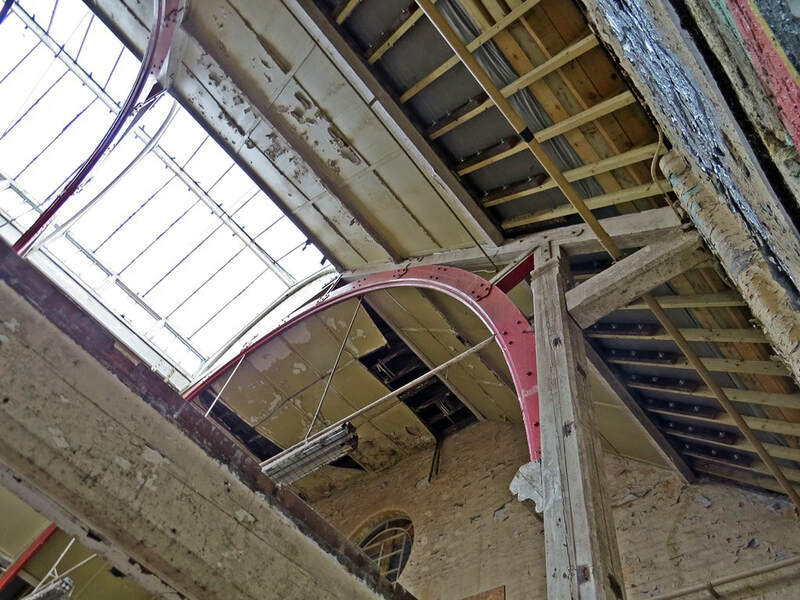 At one stage of its life, it boasted a spacious canteen with a sweeping corner bay window leading on to a terrace with pool views. 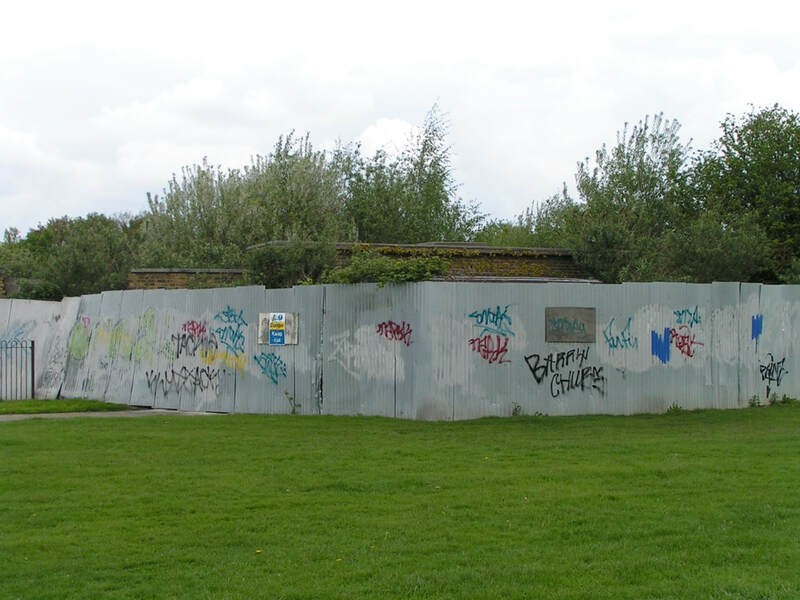 Twickenham pool was closed for repairs in 1980 and remained disused ever since with the pool area covered in grafitti and overgrown with bushes. 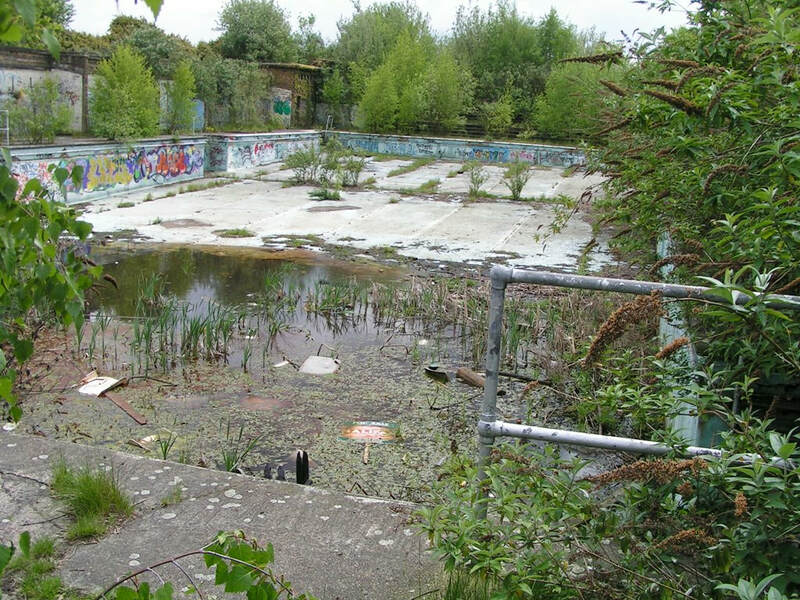 The old swimming pool was filled in and all buildings demolished in 2005. 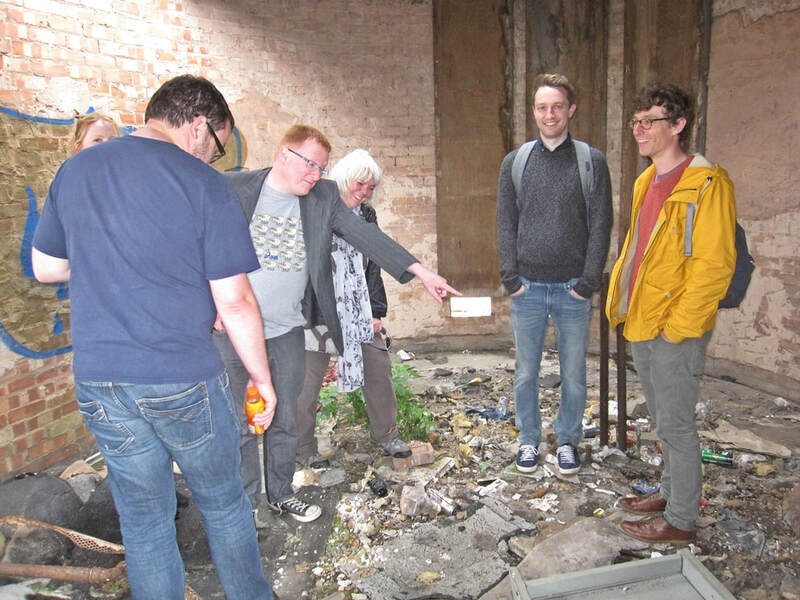 Among the general rubbish the contractors also had to handle many old syringes which were littered around the site. 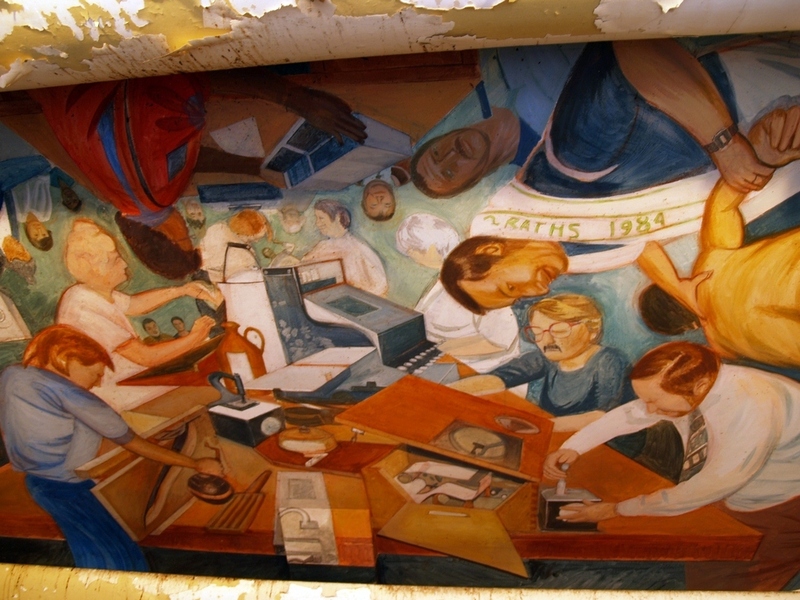 The site is now public gardens. 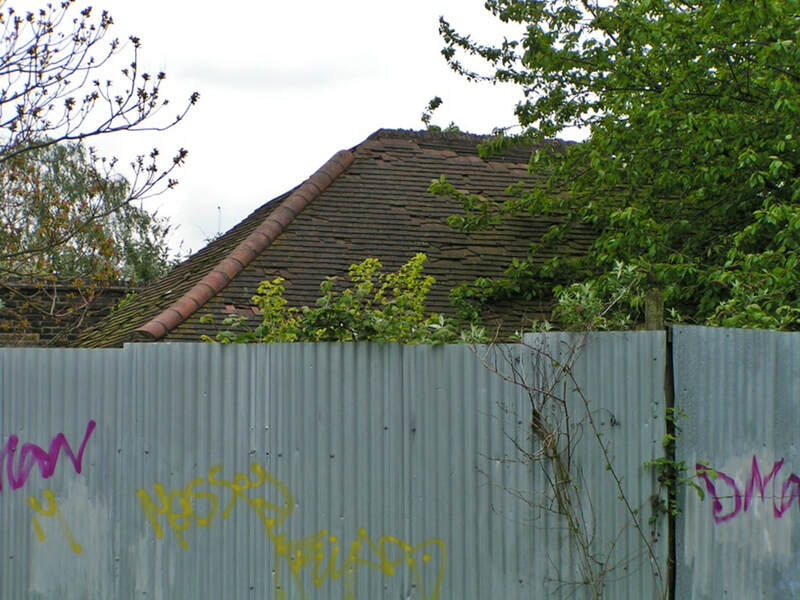 Monica Hall writes to Derelict London: "I went to Twickenham County Girls' Grammar School, and we were marched in a crocodile down to the baths immediately after the Easter holidays for 'summer term' swimming lessons. I remember a day in April, overcast and chilly, when we were made to jump in water at 46F. A highly memorable experience. I was 14 and yet thought I might suffer from cardiac arrest. After a while, in such temperatures, one got rather light-headed and it didn't seem so bad .... we may have been close to hypothermia.... "
Purley Way Lido opened in 1935 and closed in 1979. In the summer of 1976, 9,000 people a day visited his lido. 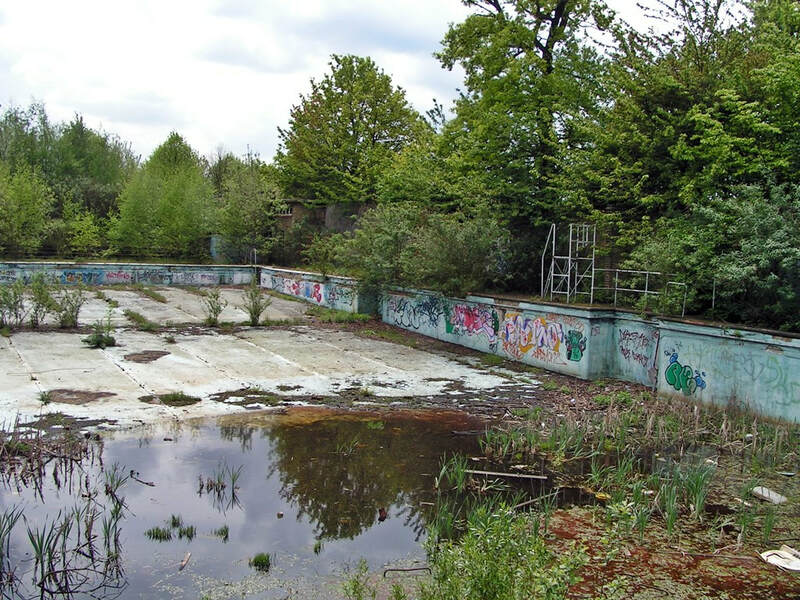 The lido was one of the most up-to-date open-air swimming pools of the time. It included a 650,000 gallon main pool and separate children’s paddling pool. 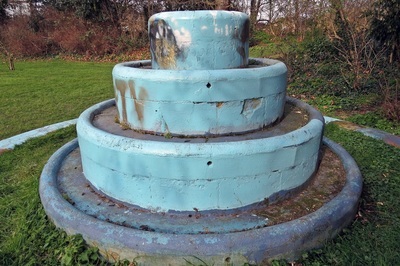 At either end of the pool were large Art Deco fountains, lit at night with changing coloured lights. The lido was regularly used for international water polo matches. 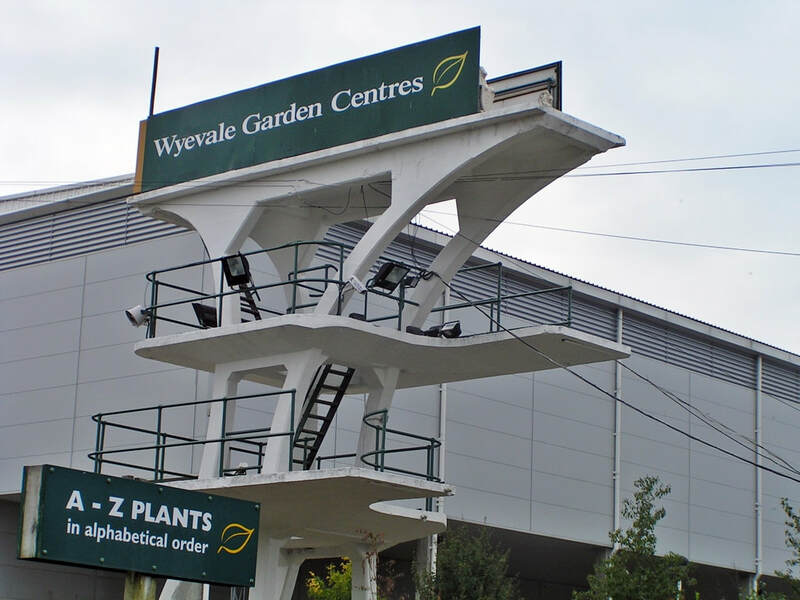 The diving board stage survives and is Grade II listed which provided a grandiose advertisement hoarding for the garden centre which until late 2018 occupied the site including a few of the old lido buildings.The garden centre was officially opened in 1981 by comedian and radio and television personality Cyril Fletcher. 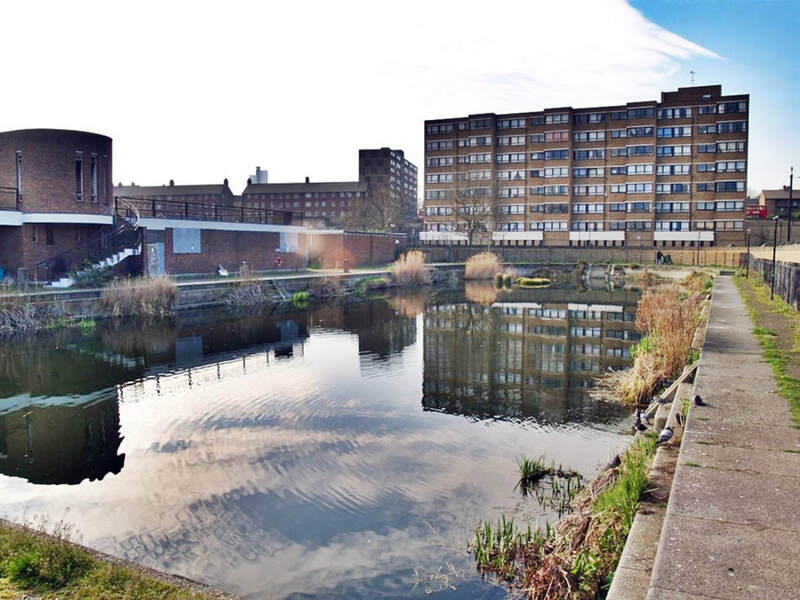 Housing is expected to be built on the site whilst retaining the diving board stage. 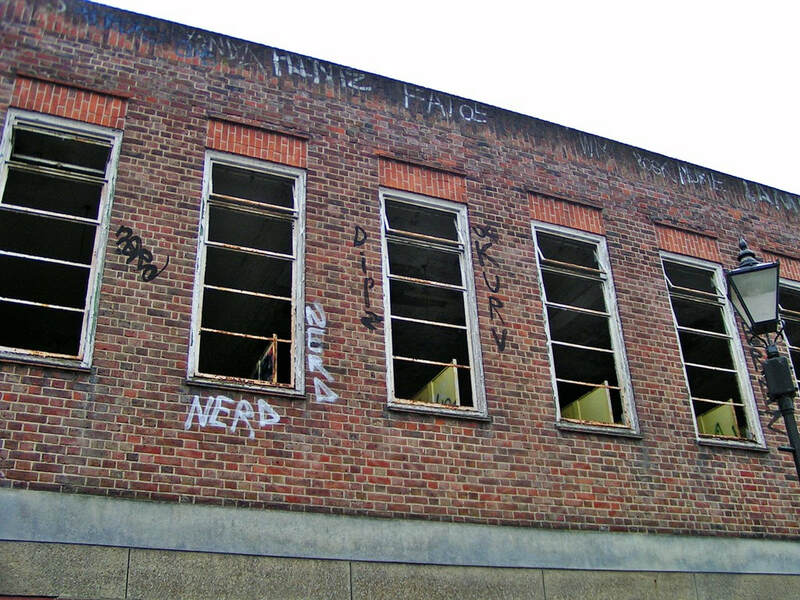 Hornsey Baths closed in 1991 and the buildings were abandoned and being squatted when I took took the first photographs in 2005. 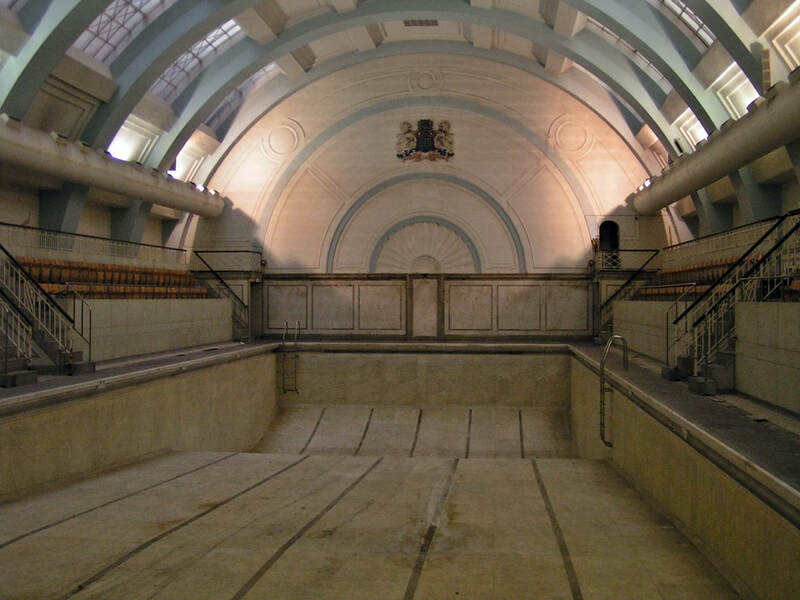 Shed Seven recorded the video for their 'Dolphin' single in the derelict Hornsey Road Baths in 1994. 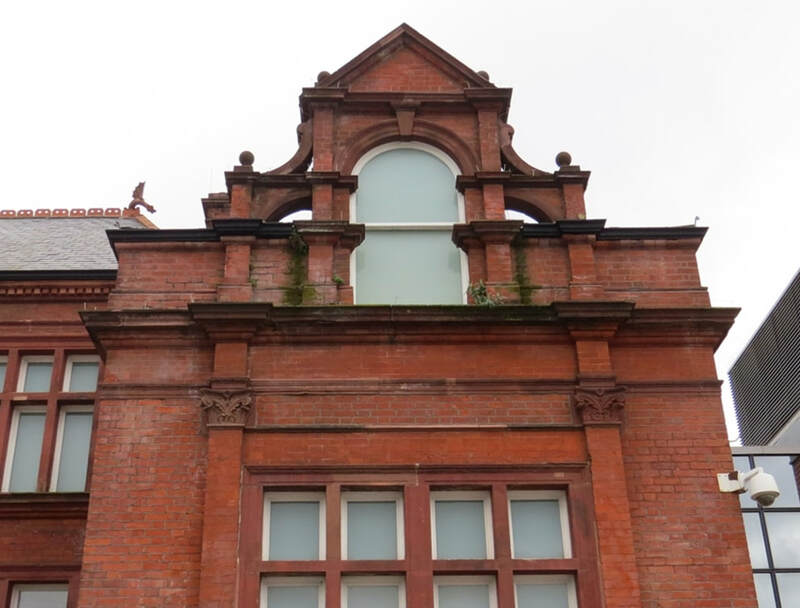 It featured 4 swimming pools, 125 slipper baths and a laundy. 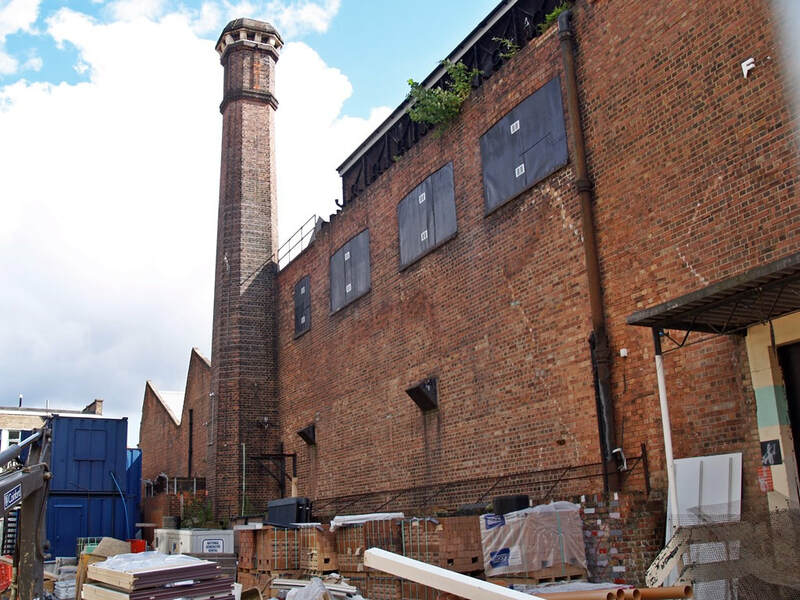 When it opened in the 1890s it was the largest complex of its kind in the UK. 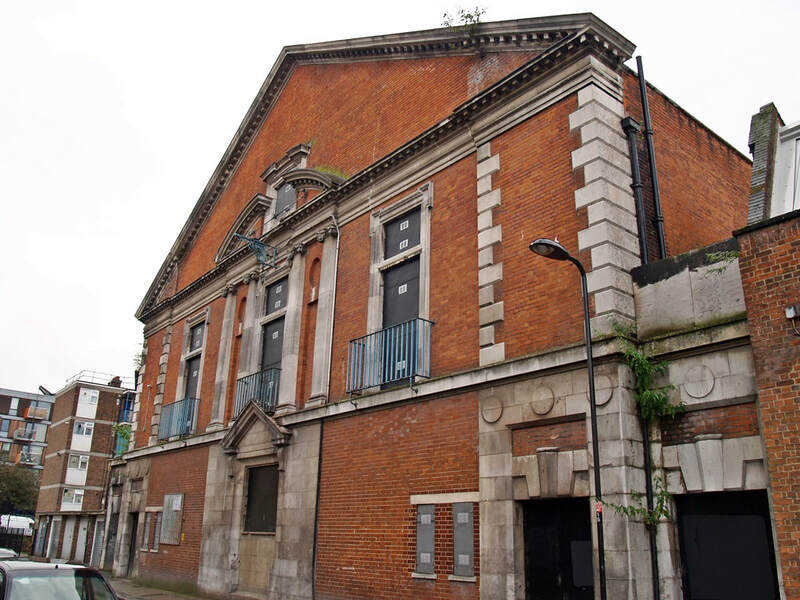 The building was also used as a concert hall, gym and boxing venue. 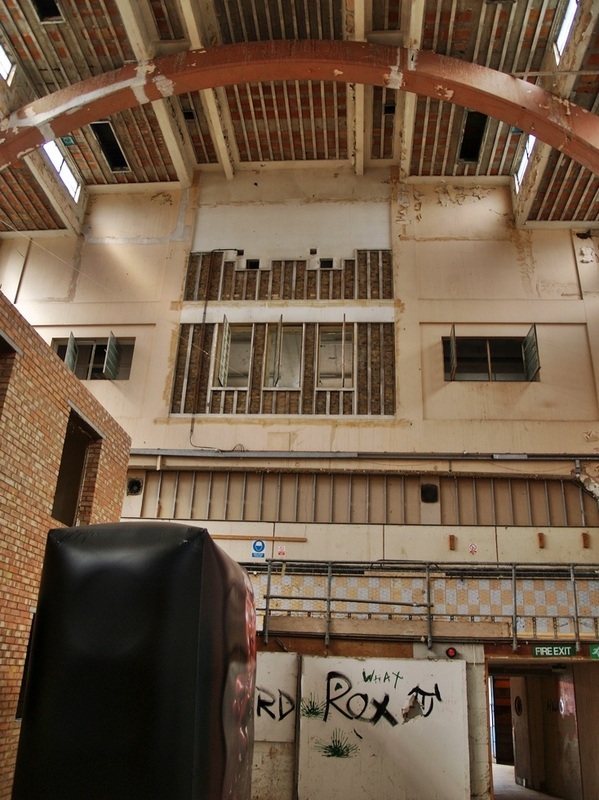 After severe bomb damage during WW2 the building was substantially reconstructed in the 1960's. 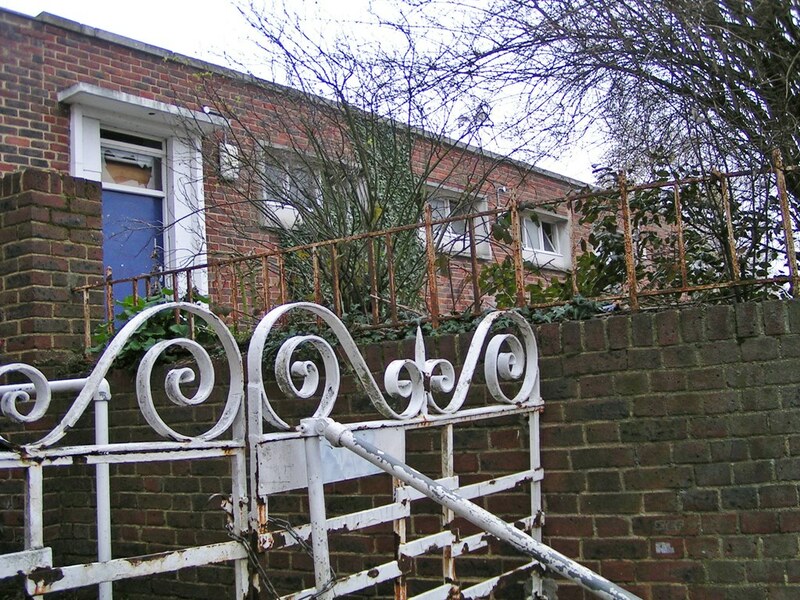 Much of the site has now been renovated and consists of housing, a nursery, community space and offices. ​James Allen writes: "I remember when the baths closed down as a teenager. I also remember when they found a woman dead in the car park. 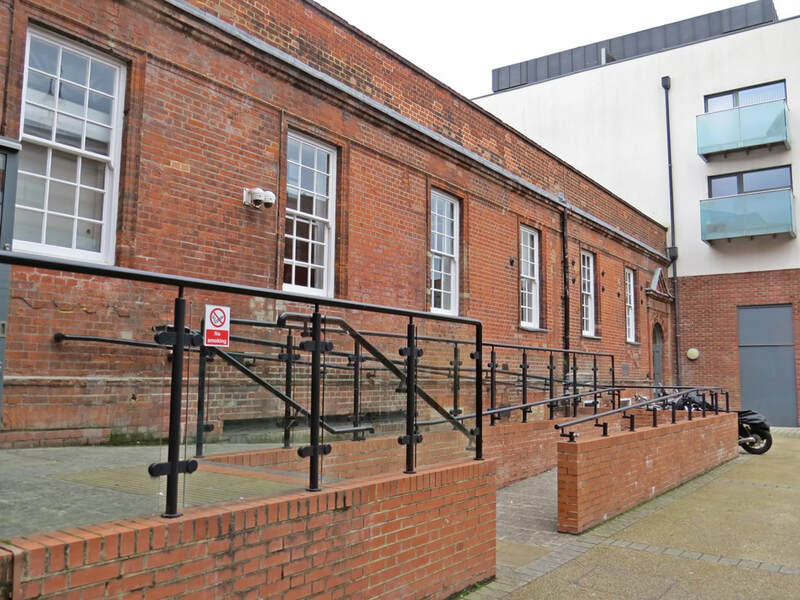 The people that used the baths and the staff thought the woman was asleep in her car, she had been dead for two days before someone raised the alarm." 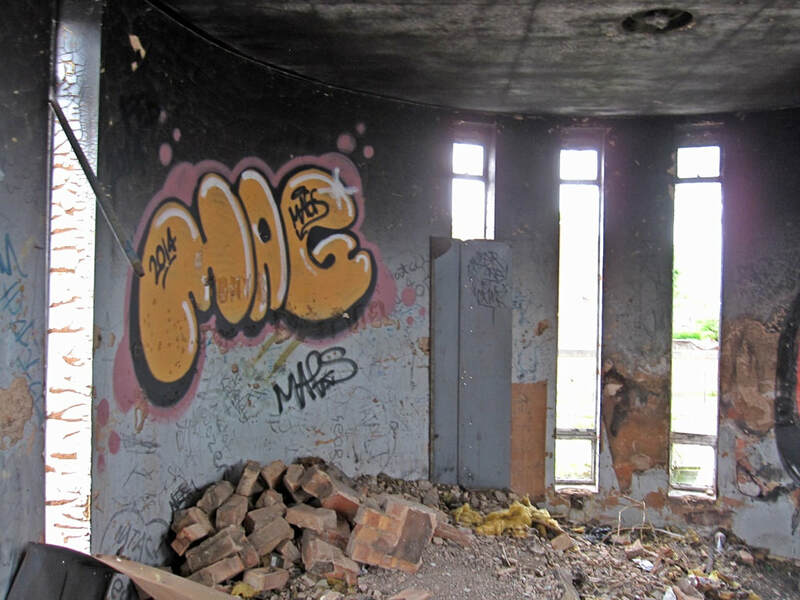 Sara Hiorns writes to Derelict London. 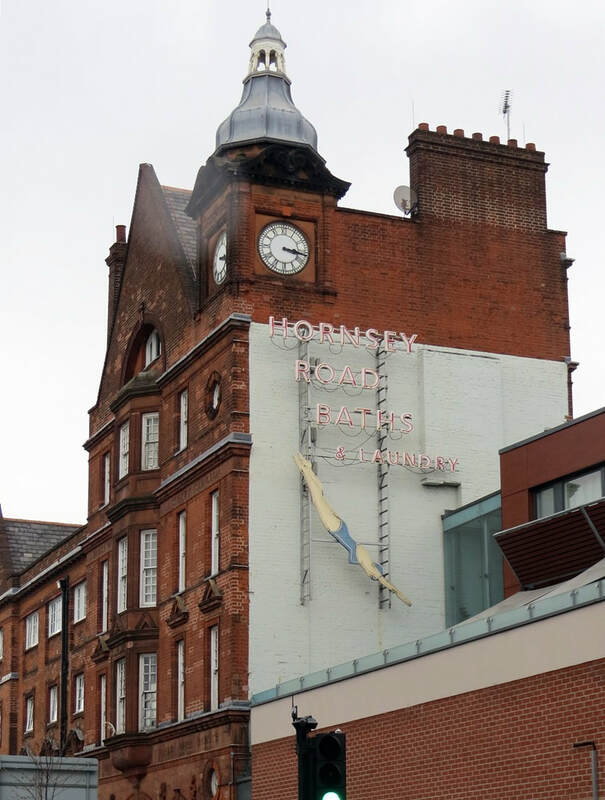 "I loved seeing your photos of the old Hornsey Road baths. I remember one really hot and frowzy afternoon in 1976 at the end of the long summer holidays, my Dad drove me round in his Capri looking for somewhere to go for a swim - or a 'bathe' as he called it in his old fashioned way. 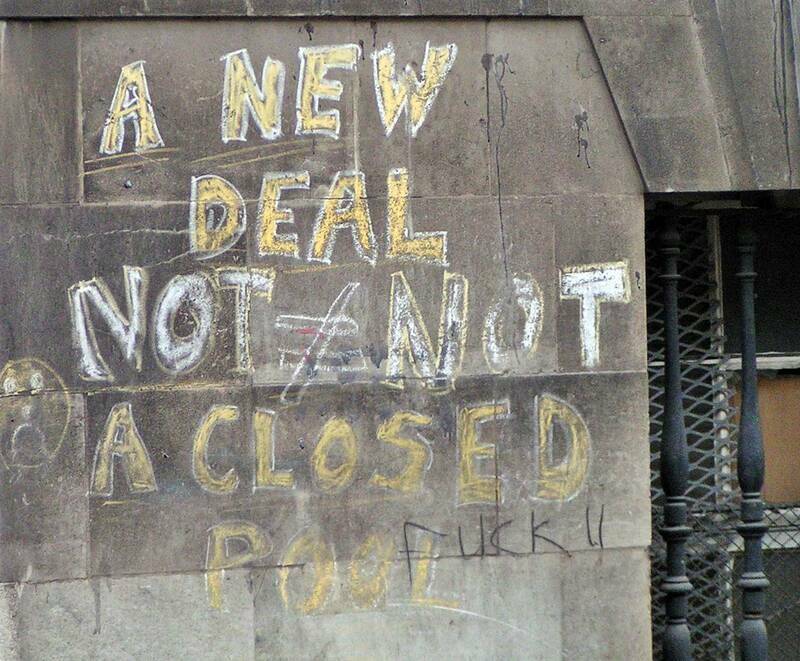 We lived in Archway and we'd already tried Park Road Pool in Crouch End which was too full. At the last minute we drove hell for leather to Hornsey but that was full as well. My Dad always used to carry his towel under his arm with his trunks rolled up in it". 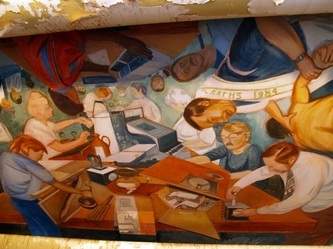 ​Opened in 1896. 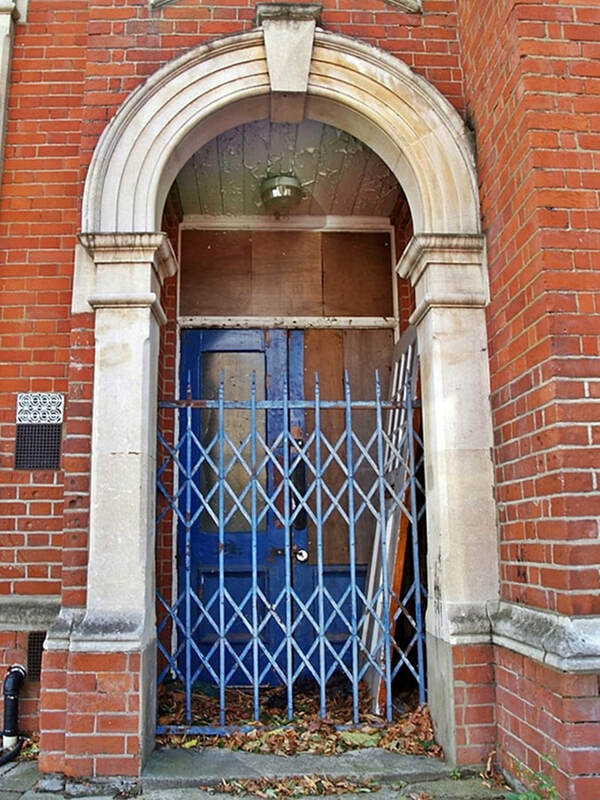 A police band played outside before a silver key was used to open the entrance. Entertainment was provided by acrobatic displays from a dance toupe. 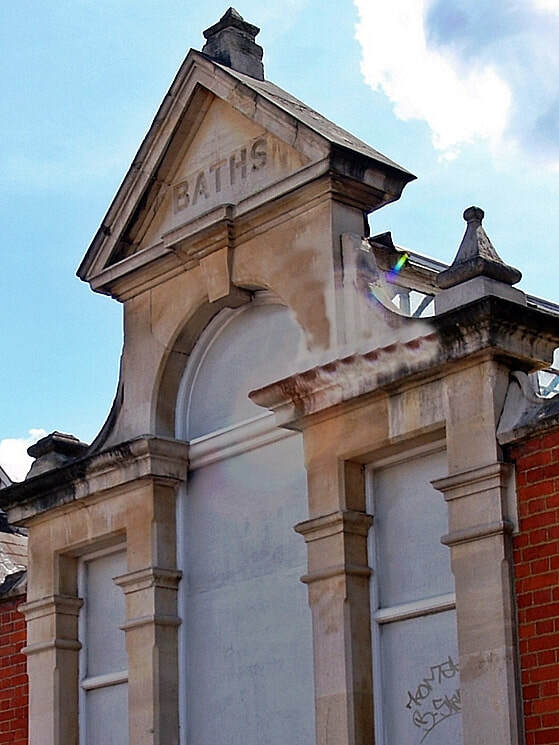 ​Baths like this were built by local authorities from the 1860's onwards to allow poor people to wash themselves (as distinct from swimming baths). 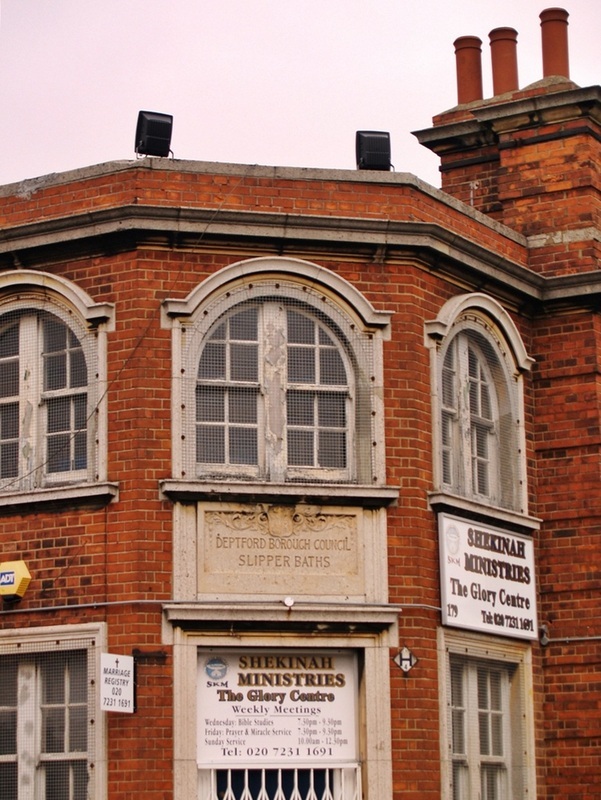 Slipper baths were bath tubs in a similar shape to a slipper, slowing the rate of cooling of hot water and considered to protect the modesty of the bather.One paid and went through a turnstile to join the queue which on busy days might spill out on to the street. The front part of the queue sat on wooden benches, moving up each time the Attendant called 'Next! 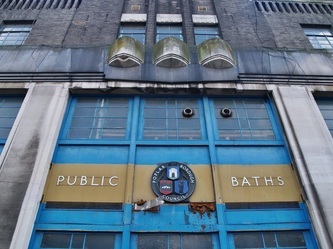 The baths were opened in 1915 and closed in 1975. 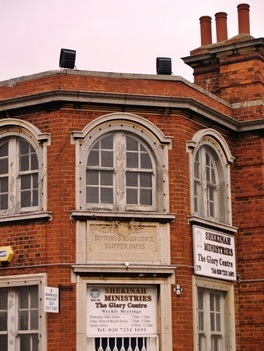 In recent years was the home of Shekinah Ministries then a car windscreen replacement service and demolished in 2016 to make way for a block of flats. 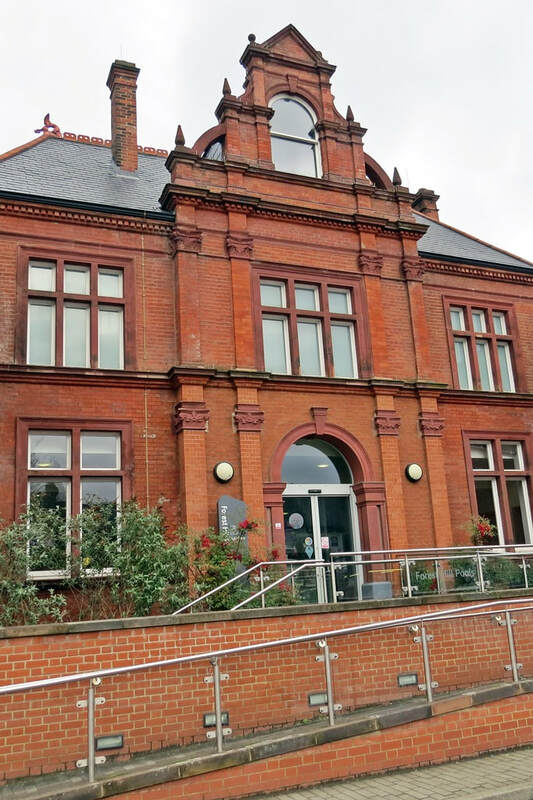 The Council Leisure centre opened as the Streatham Baths in 1927.This recreational amenity represented the latest ideas in Swimming Pool design, filtration and chlorination. 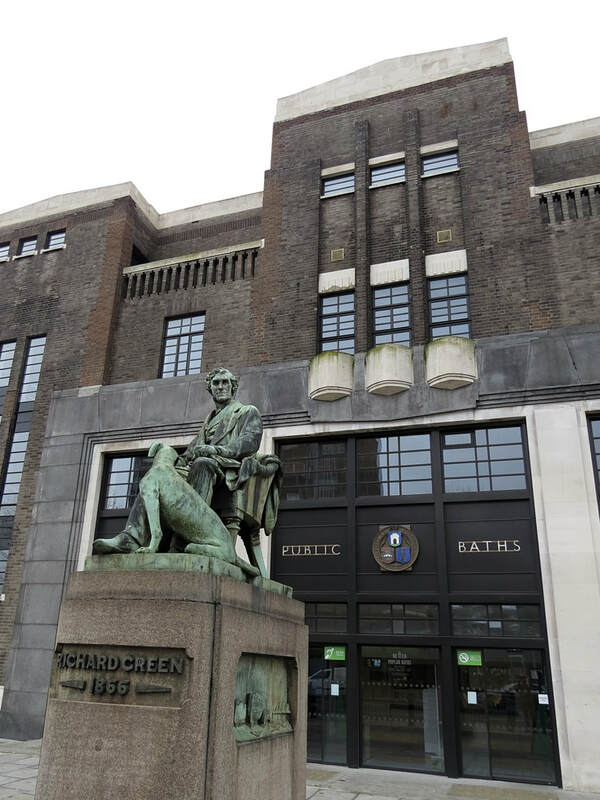 The Baths were designed in a classical civic style, traditional Edwardian but with a mix of later modern elements. 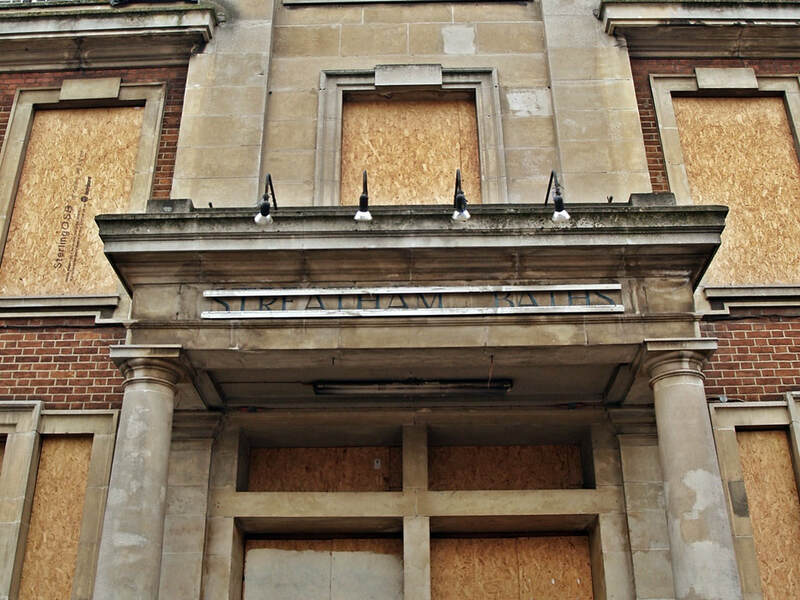 Streatham Leisure Centre closed in 2009 due to health and safety concerns.The decision was taken after structural engineers raised concerns about widespread structural problems in the crumbling pool's building. 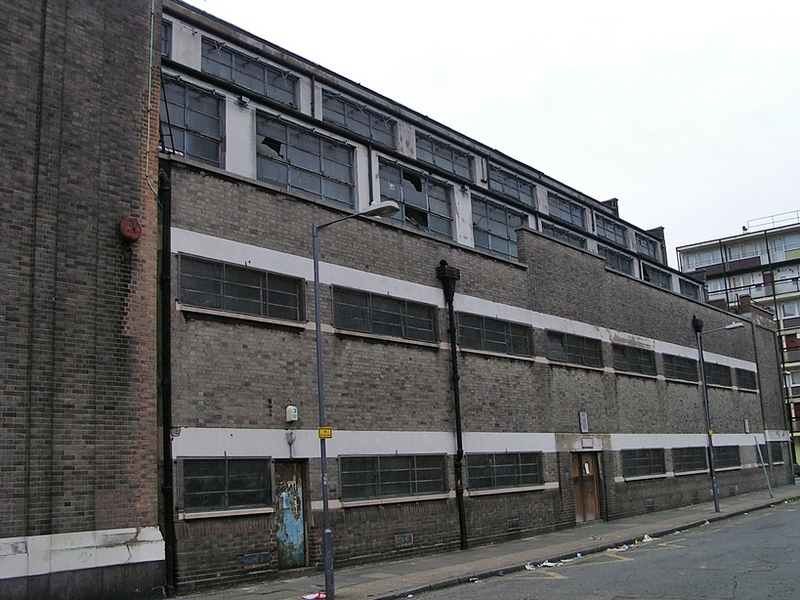 The building and the adjacent ice rink was demolished and replaced with a Tesco supermarket and flats. The council and Tesco built a new "state of the art" leisure centre and ice rink a few years down the road. Below are some more photographs taken in 2011. 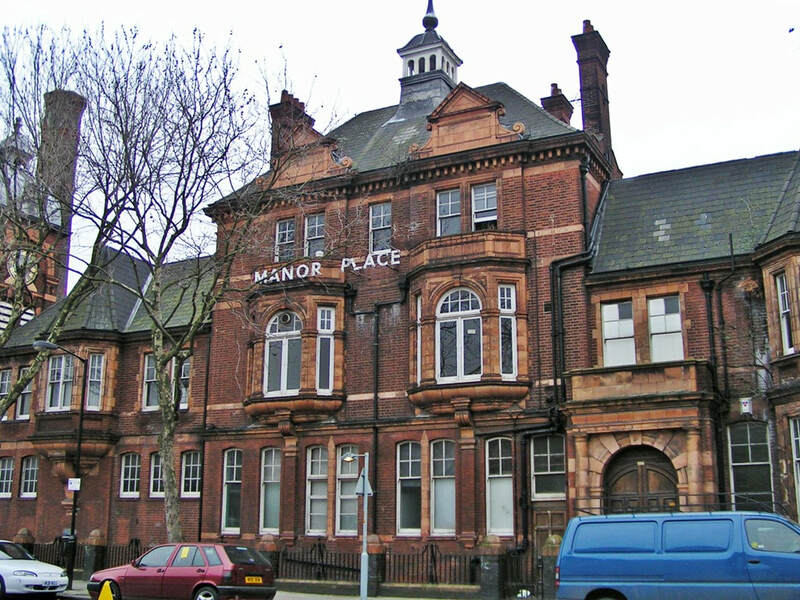 Manor Place Baths opened in 1898. The mayor of New York City said around that time: "There is no public bathing establishment even approximating this in the United States." 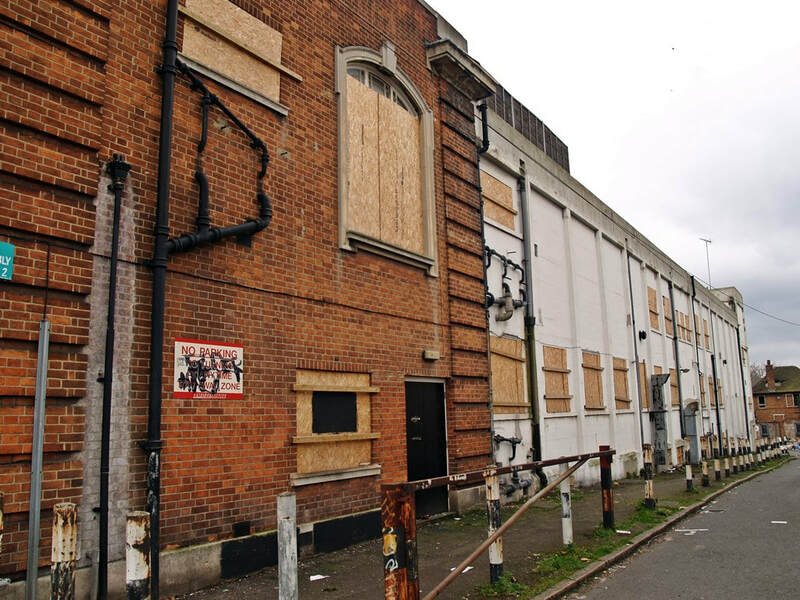 It was also used as a post war boxing venue. 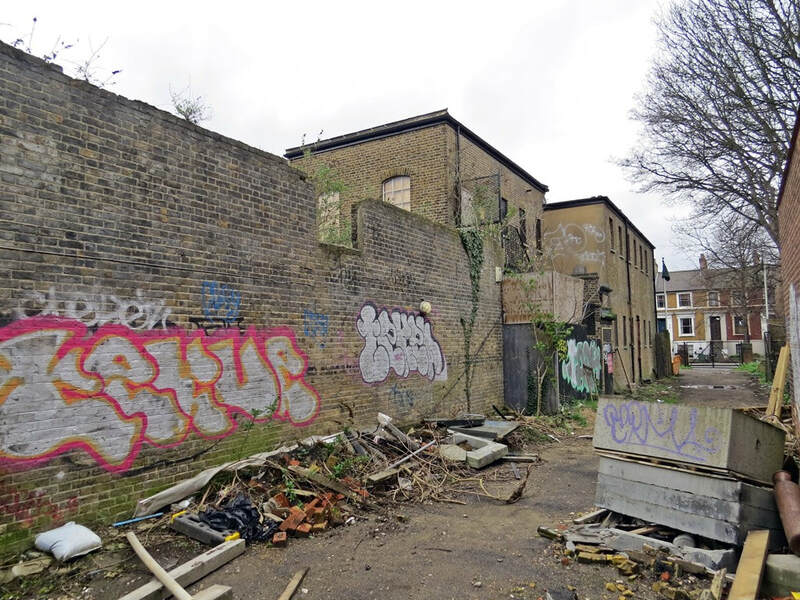 There are tales of locals seeing the losers, even winners after a fight stagger into the Walworth Road with closed eyes and cut faces wearily leaning on anxious friends. 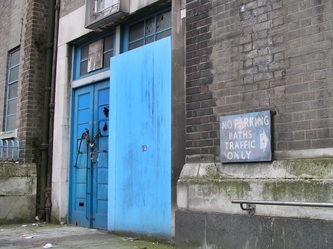 The baths closed in 1976 but continued as a boxing venue until a final show in 1978. The building was used by Southwark London Borough Council as offices until 2005 with part of the grounds are used as a council waste recycling depot. 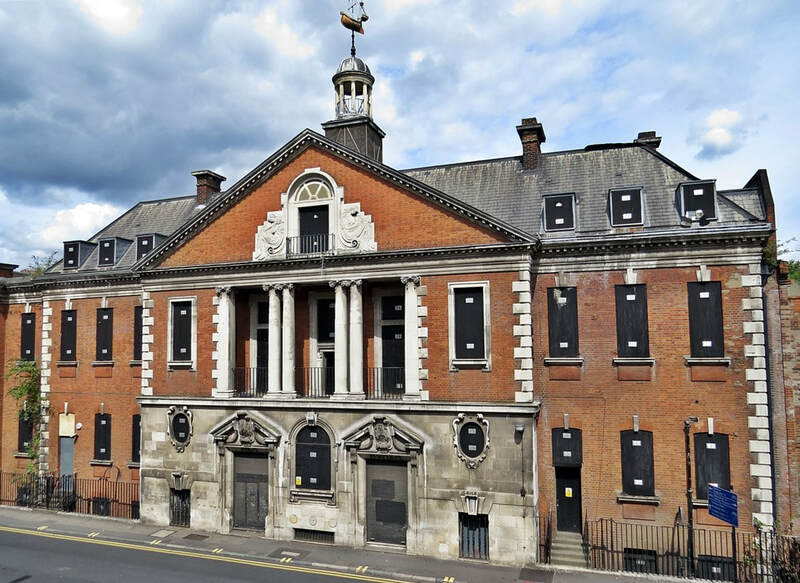 Kagyu Samye Dzong used the building as a Buddhist meditation centre from 2007 for a few years until the site was purchased by Notting Hill Housing who are currently converting it into housing. 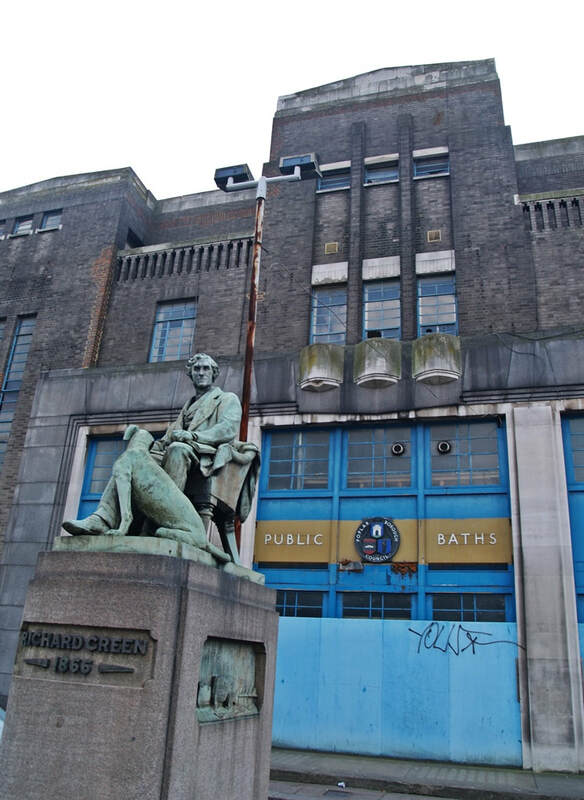 Dennis O'Reilly writes to Derelict London: "Manor Place Baths also had the public baths where as a kid I was sent there once in a blue moon to get a proper bath! And had to call out your cubicle number for more Hot or Cold! 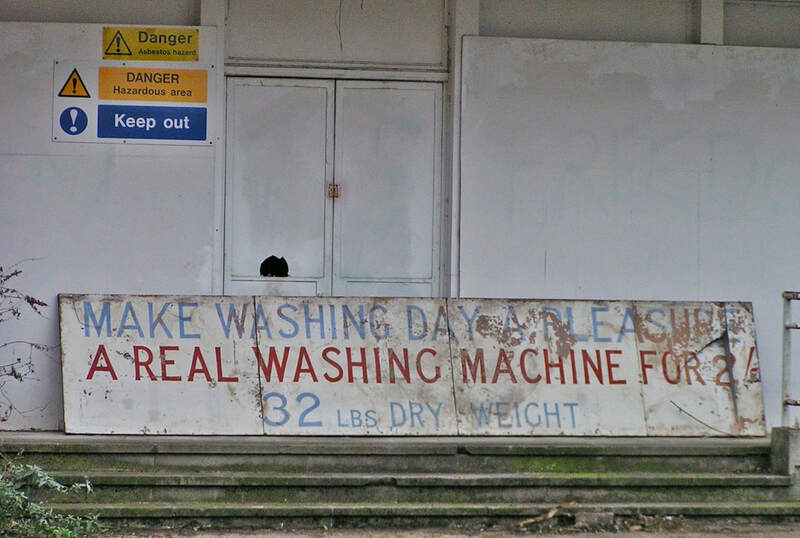 It was also the local wash house with big tubs & dryers for the mums to do a weekly laundry by hand." I remember going to the laundry with my mum in the school holidays in the early '70s. Hours of boredom, but it was an amazing huge (seemed to me) communal area - where women chatted, swapped out-grown kids clothes and accused newcomers of jumping the queue for the machines in an atmosphere of perpetual damp heat. There were giant front loading washing machines, a mangle, a roller contraption for pressing sheets and what I can only describe as huge wall of clothes horses that slid into some sort of heated chamber where the clothes got dried. 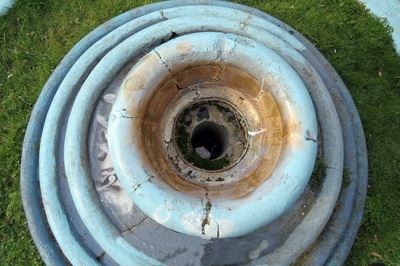 That was free as opposed to the few tumble dryers that you had to pay for. It seems a really strange mixture now; right on the cusp of the old and the new, like a lot of stuff in the '70s. There was a large double door in the pressing room and behind that was the boxing arena. 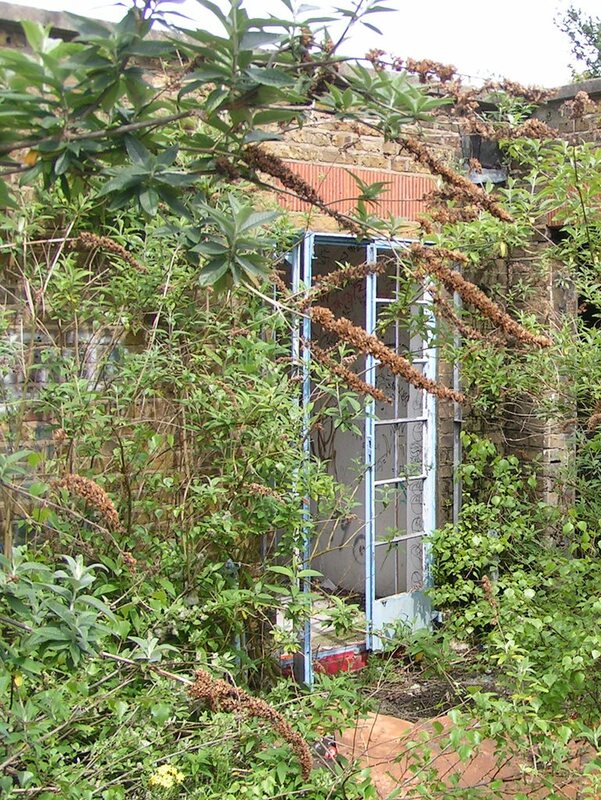 I remember once, unusually, the door had been left ajar so my 7 year-old self peeped inside. I still remember that ring looming up out of the dark, flags hanging all around from the high ceiling and a faint smell of something unusual!" 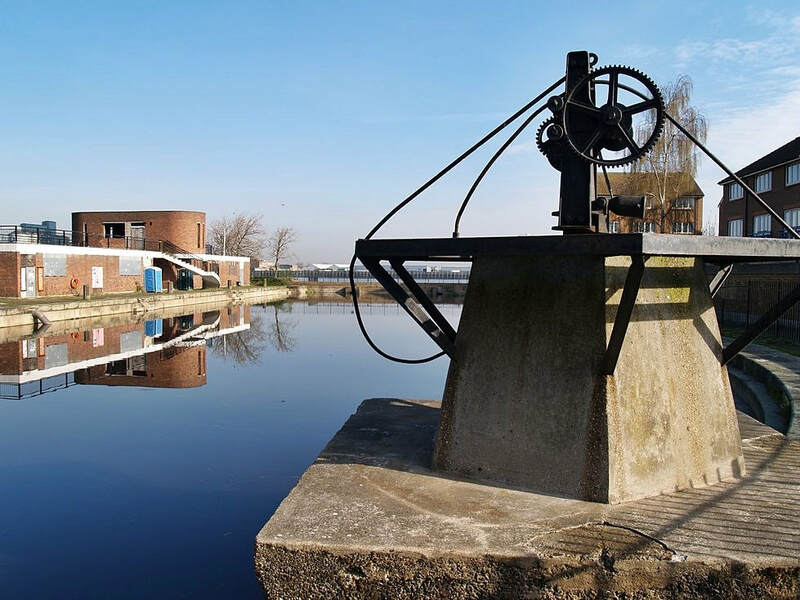 ​Opened in 1979, the Aquatic Centre was built out of two old dry-docks from the former Woolwich Dockyard (aka The King's Yard) founded by King Henry VIII. 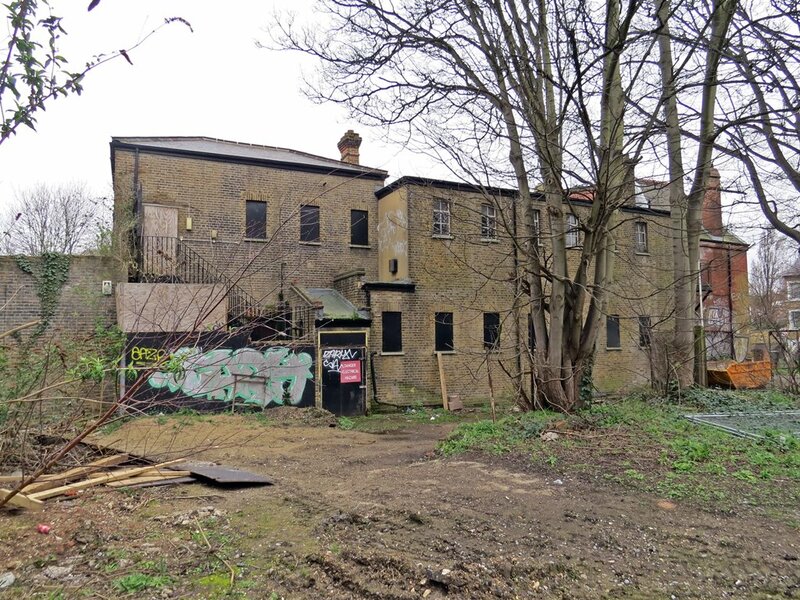 It was a naval dockyard along the river Thames where a large number of ships were built from the early 16th century until the late 19th century. 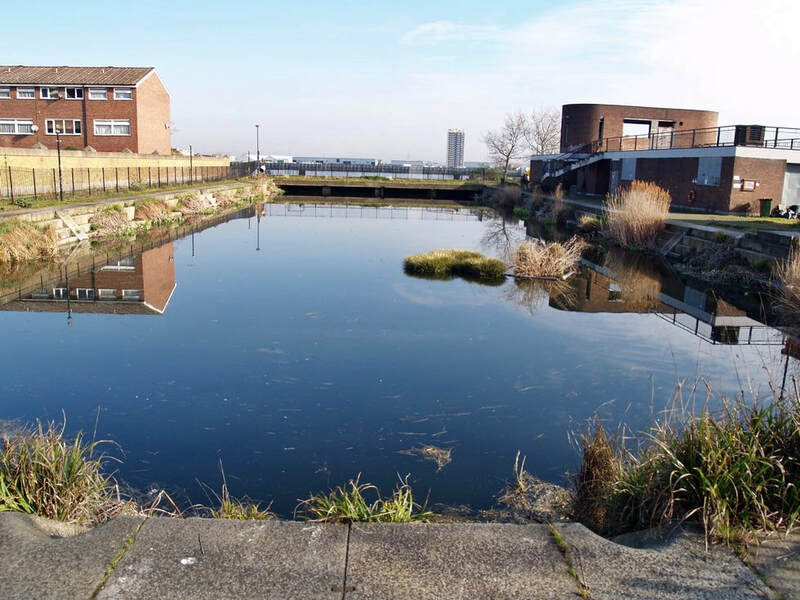 The Centre whose buildings were constructed between the two old docks was used for canoeing, diving and fishing. The facility closed in the late 1990s though fishing continued until recently. 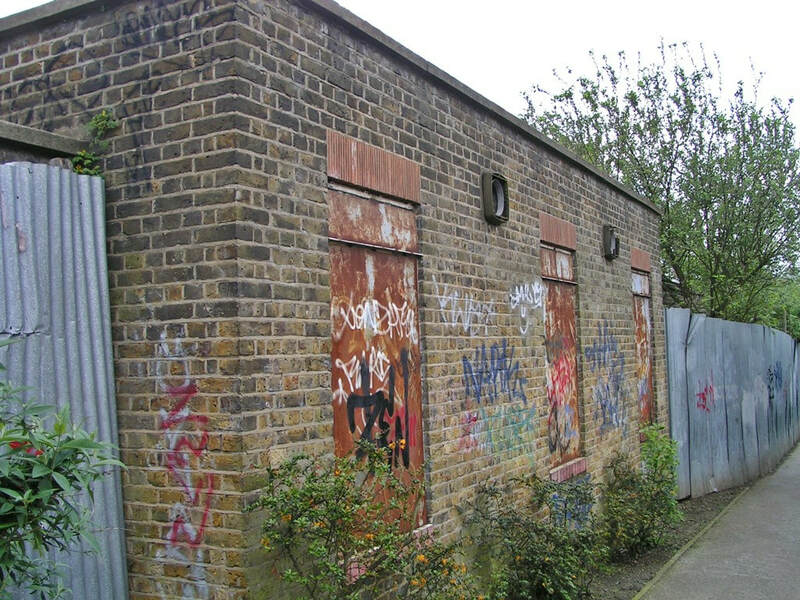 The lido style buildings remained derelict and popular with drug users until demolition in 2018. 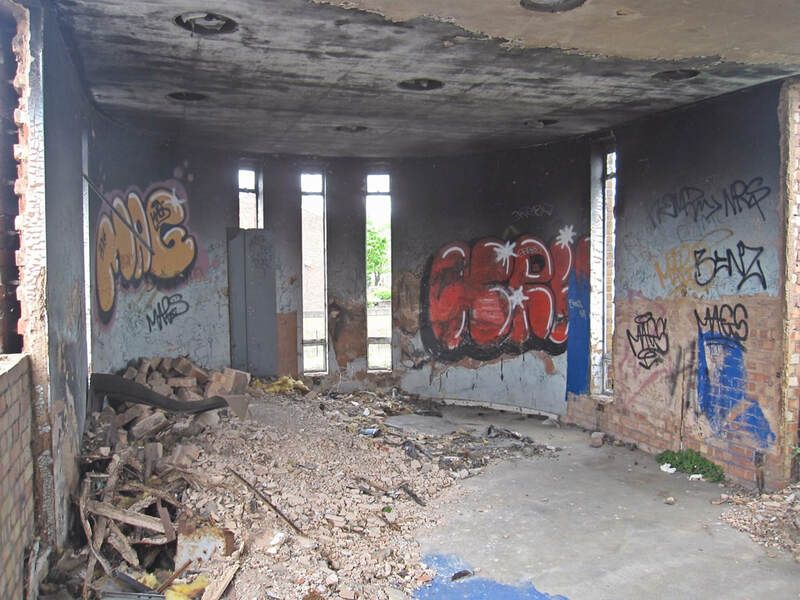 The photographs below, taken in 2016-2017, show some of the abandoned interiors including Daryl of local blog 853 pointing at a used syringe.